At Bramshill the shore of Long Lake had enough going on for observation and I had a few half-hearted attempts at the Emperor patrolling, but he was too far out and unpredictable. While Sue took a rest I explored my usual circuit without much joy and returned to the shore of Long Lake to see if anything had changed. It hadn’t, so we decided to take a walk. After all, way too early to call it a day. We decided to walk to the north-east pond in the hope that we’d find a few feeders on the way. 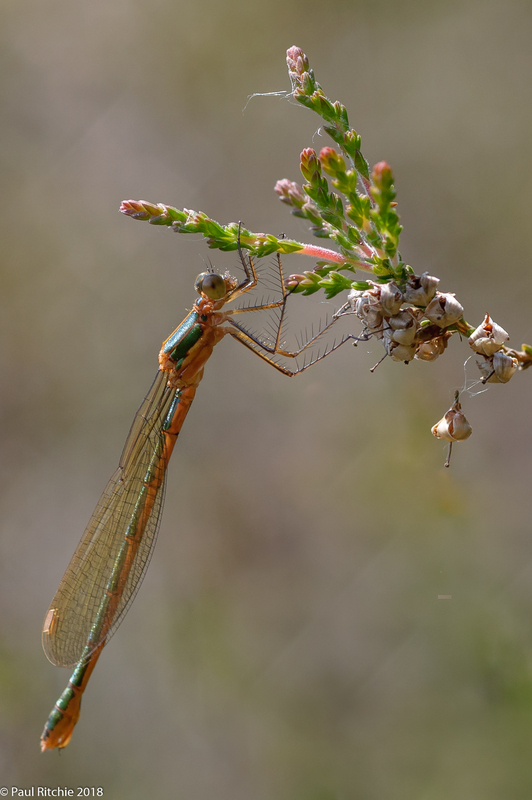 We did, mainly demoiselles and damselflies holed up in the gorse and grasses bordering the paths. On arriving at the pond the usual sight of battling Chasers and Skimmer’s, an Emperor or two and a Downy brightened an afternoon which had become dull under cloud. At the far end however, patrolling a small area of the murkiest section was a reward for the day – an early patrolling Brilliant Emerald. In view of the light a record shot is all I managed, but it was the icing on the cake of a disappointing day. 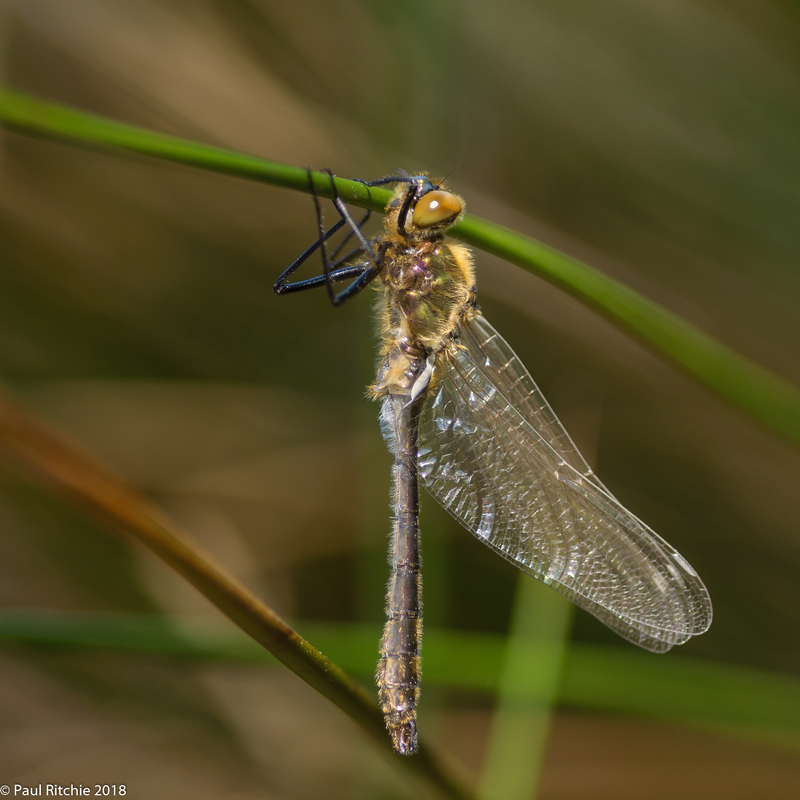 I returned to Bramshill with a sense of hope and the added advantage that I could move and loiter at my own pace; taking in the north-east pond first and continuing along a new found path and a new diversion along a wonderful sunny ride with Meadow Brown and White Admiral joining the Demoiselles. The type of sunny ride it would be wise to camp out at, as you never know what might turn up. Not today though, I wanted to cover as much ground as possible, calling in at the center ponds and following familiar paths hoping for a moment. I had a long moment on the shore of Long Lake just watching the action, because sometimes you just need to take it all in. Pretty much the same as cast as Saturday only much more to enjoy. 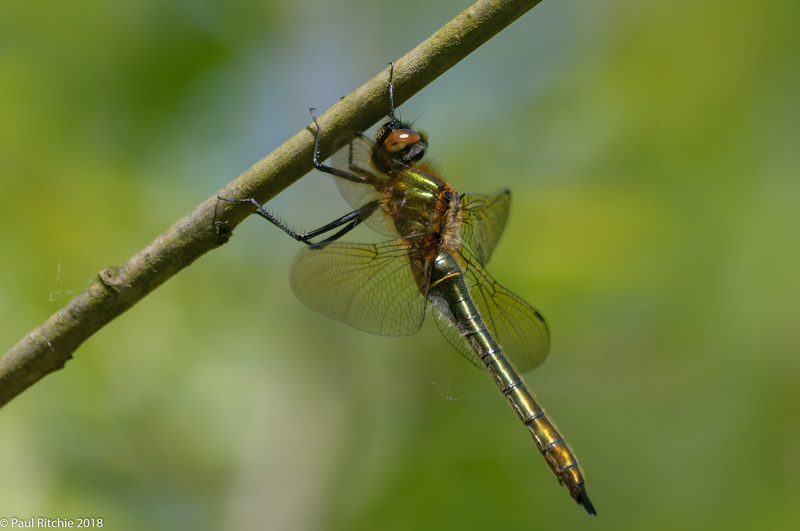 Once I broke free of the reverie I continued along the path, festooned with Black-tailed Skimmers; always on the ground and supposedly out of reach. 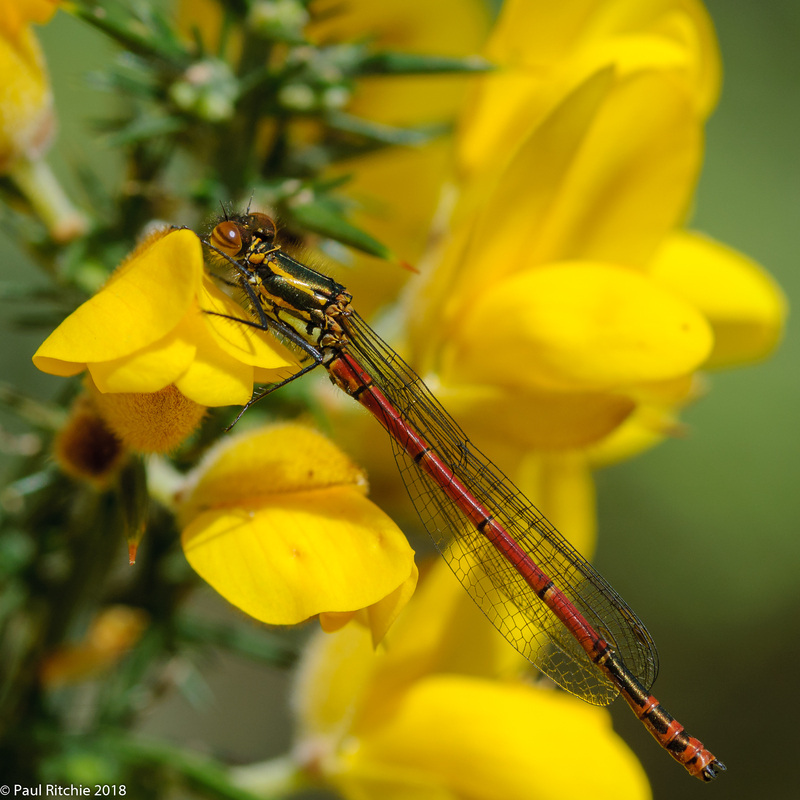 At a little inlet I found a teneral Common Darter – my first this year. 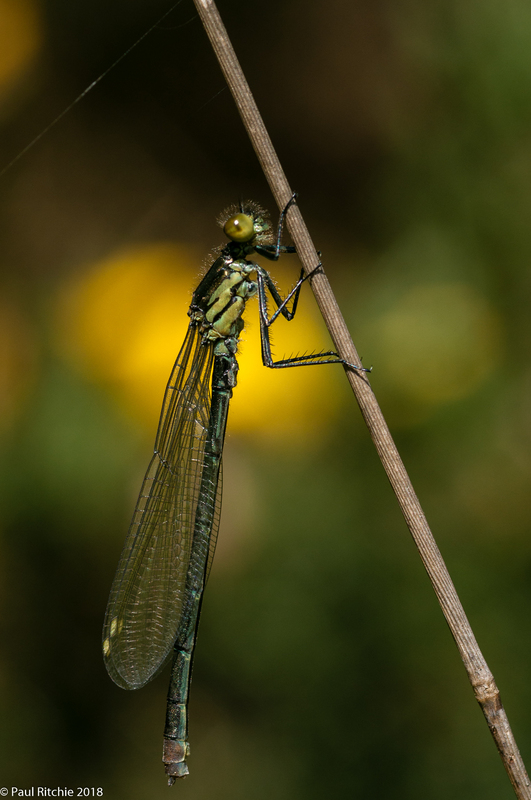 A little further down the path a female Emperor rose at my presence, hesitated and perched again, allowing me a cautious go with the macro. 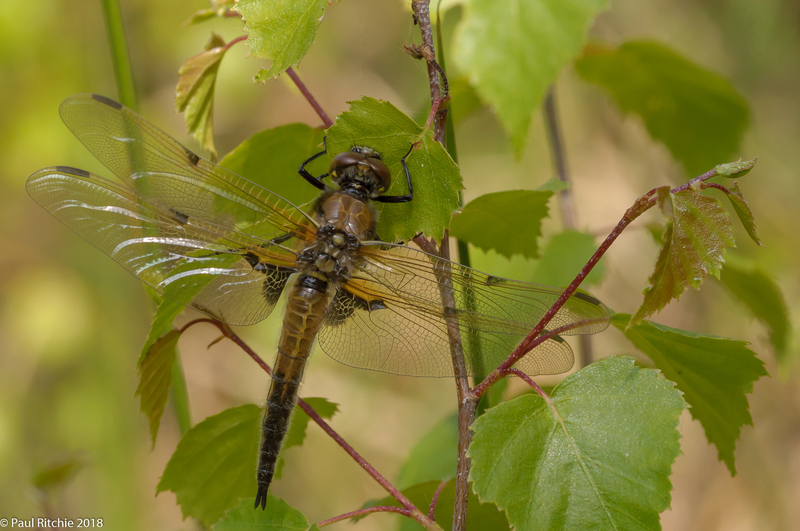 The hidden ponds were a little disappointing today so I continued to the far shore of Long Lake to catch a female Keeled Skimmer having a snack. 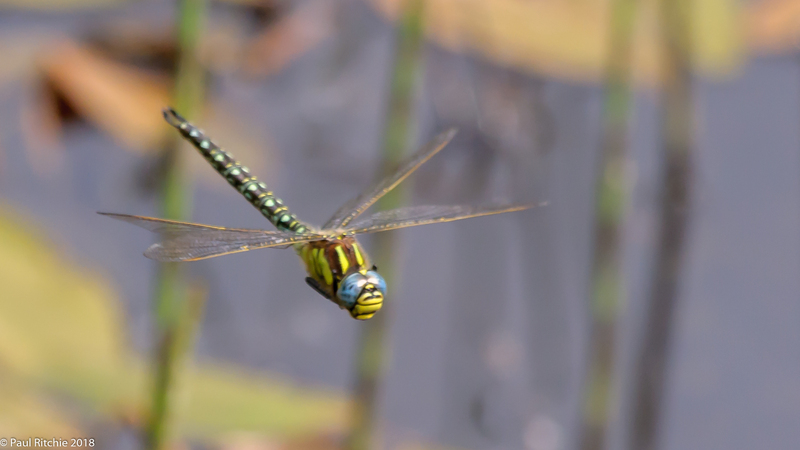 I returned to those paths I followed earlier, just in time to watch a male Hairy flying low down and back & forth before perching to eat his spoils. Who knows who else paid a visit while I was away. We arranged to meet Steve Birt at Latchmore Brook in the New Forest. With mainly sun and occasional cloud, conditions were perfect. 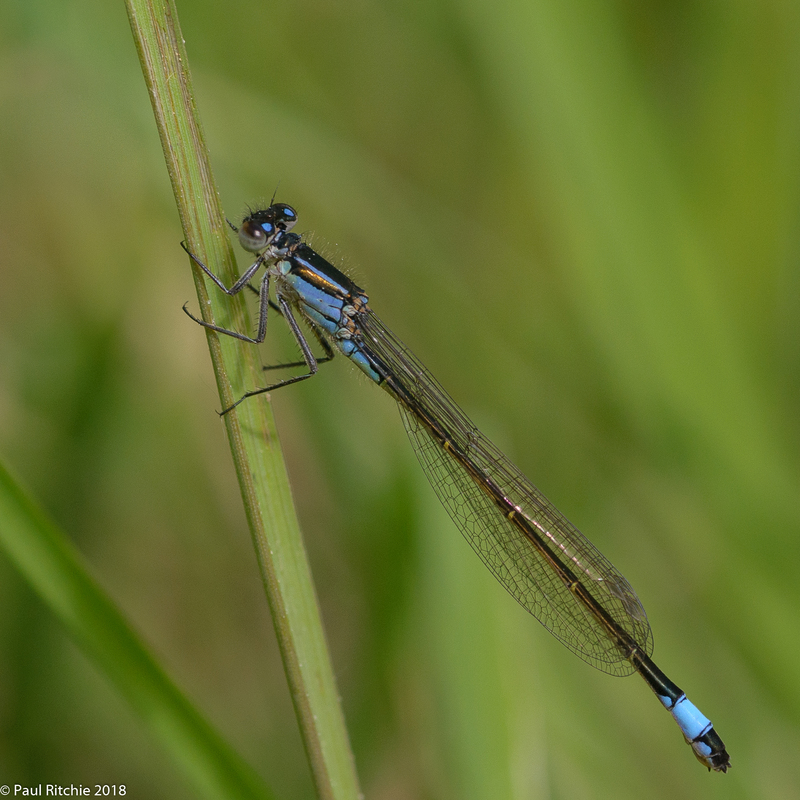 Sue spotted the first fresh teneral female on the way in; the fragile lift and shade of pink was unmistakable besides the vibrant blues & greens of the adult males patrolling the flush. Although not the best photo I’ve included it in post to show the differences from teneral to immature, an example of which you can find below. 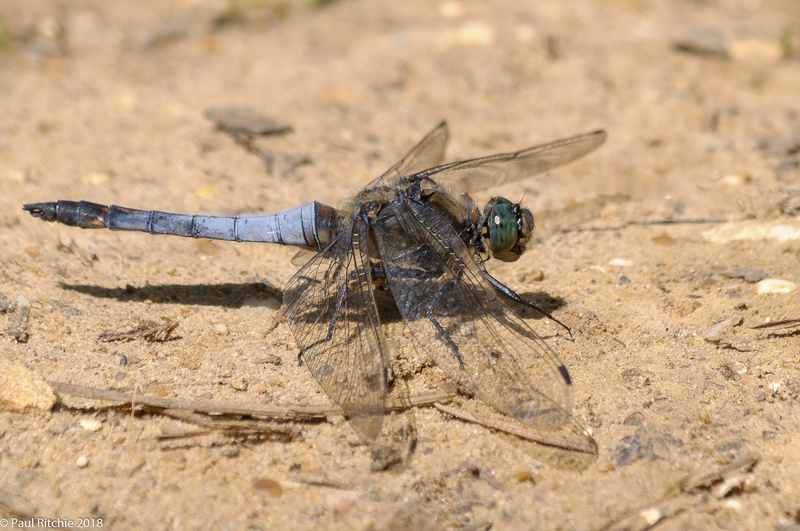 The Keeled Skimmer were a lot more lively today, with several males and the occasional pairing decorating the flushes. 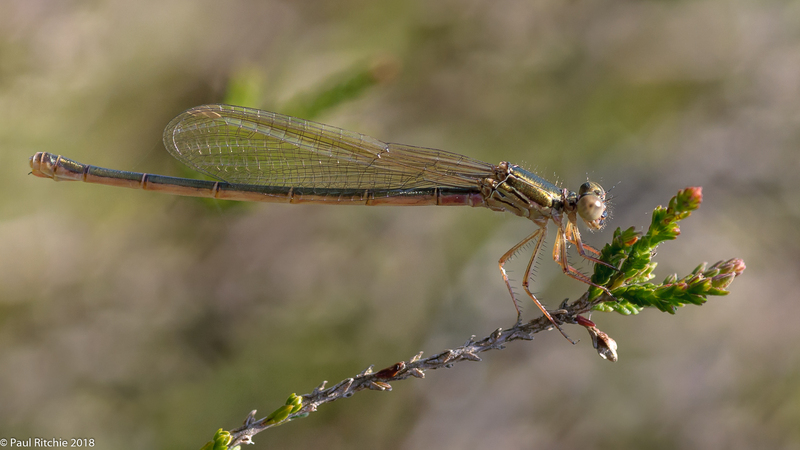 On arrival at my favourite spot the ground had dried out considerably in a week despite the frequent showers, however the heather was yet to bloom and bring forth the bonanza of feeder insects to tempt the damselflies away from water. A good few more Small Red than last week with a good showing of Large Red. 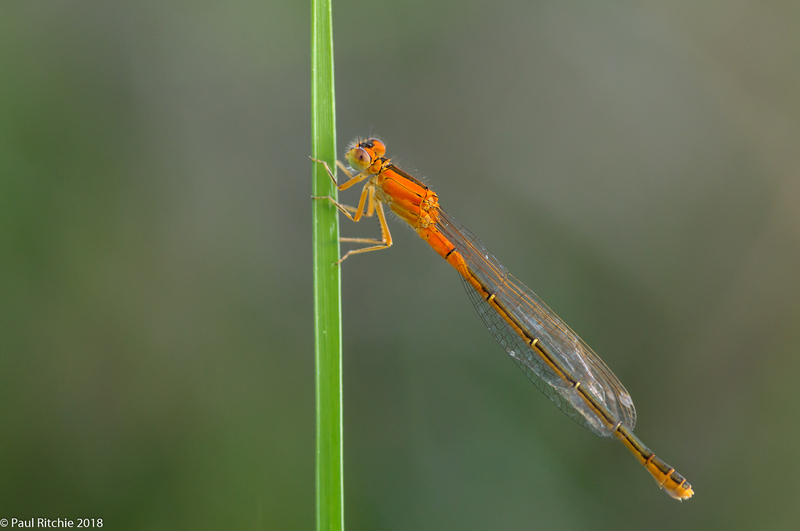 No Southern around here either, but once again Sue’s eager eyes picked up the orange flash of an immature aurantiaca. The only one found, and unfortunately with a deformed wing, however a delight to find and certainly the highlight for Steve being his first experience of the species. Thankfully it wasn’t long before we found a resting male. 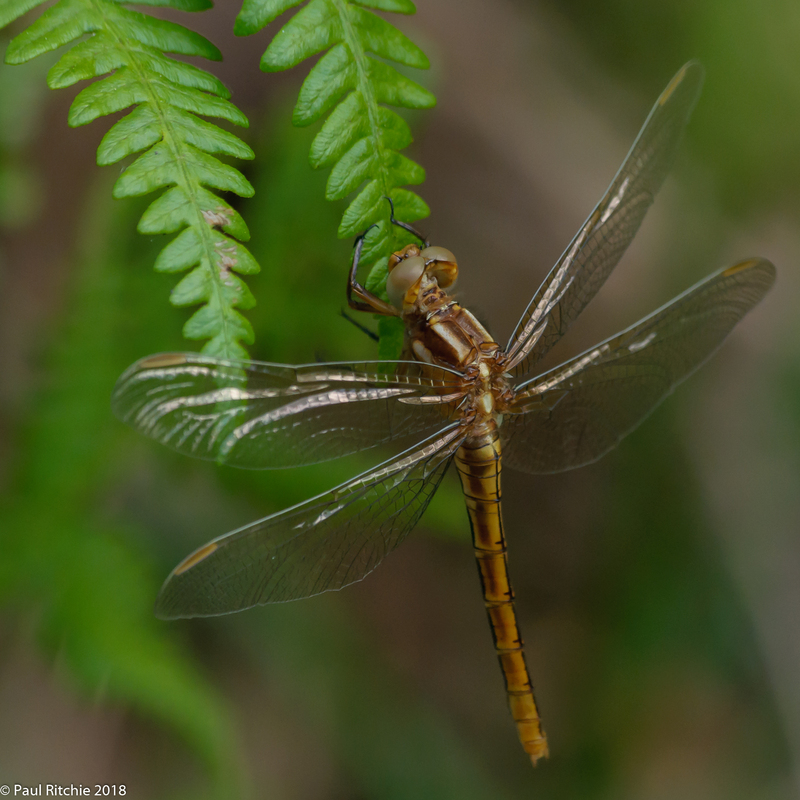 We walked upstream encountering the Southern and Small Red in abundance before returning to the back flush to marvel at the show put on by even more Southern, Scarce Blue-tailed and Keeled Skimmer. 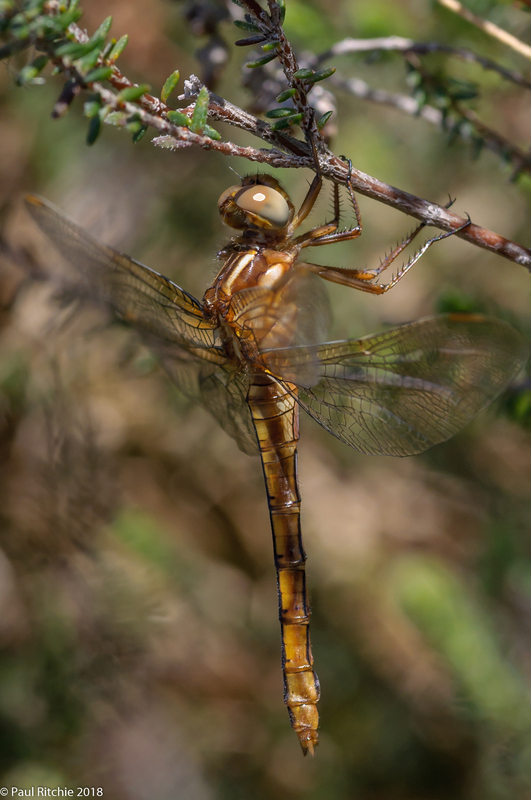 While attempting to find a way back across the flush I came across a teneral female Keeled perched irresistibly on the fern. She only gave me chance for a quick shot. 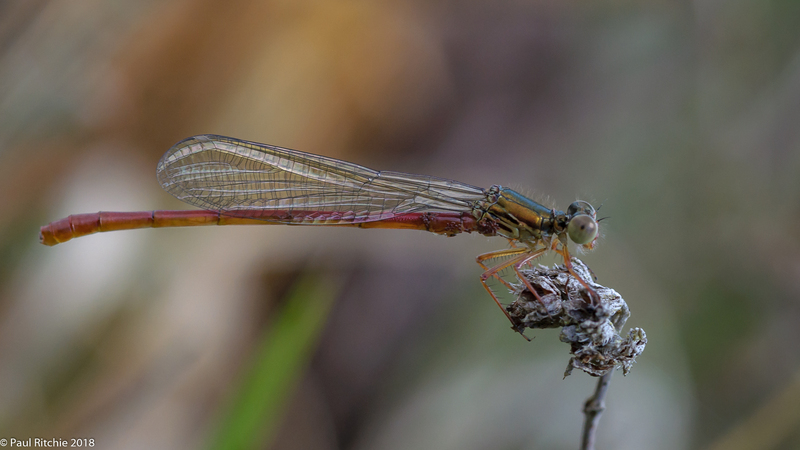 Safely back across and searching the edge of the flushes I found a fresh teneral male, still to gain his technicolor adult colouring and starkly contrasted against the striking youthful looks of the female. A beauty nevertheless, and the perfect round off to the day. 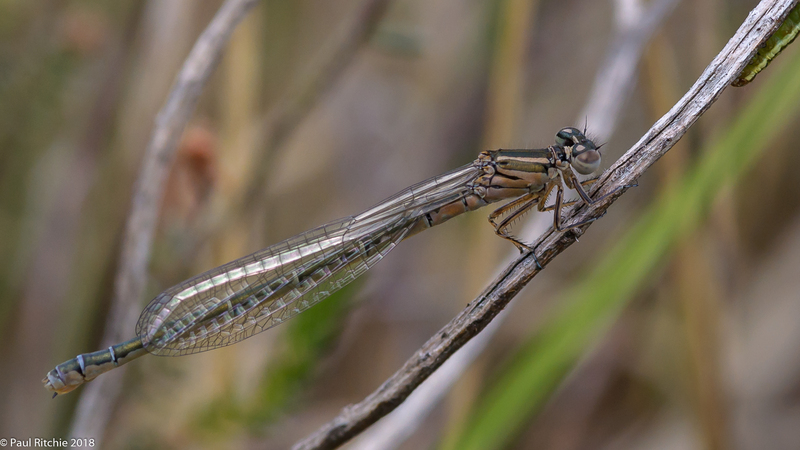 Returning to Latchmore mid-week I had the feeling I might’ve started the day a little too early as the flushes were bereft of Scarce -Blue-tailed, as was the feeding area despite an extended search. Only a few Large and Small Red in attendance. I didn’t see any Scarce Blue-tailed until I reached the back channel where I explored even more and sat watching the action for a while. Sometimes it’s good just to breathe it all in. 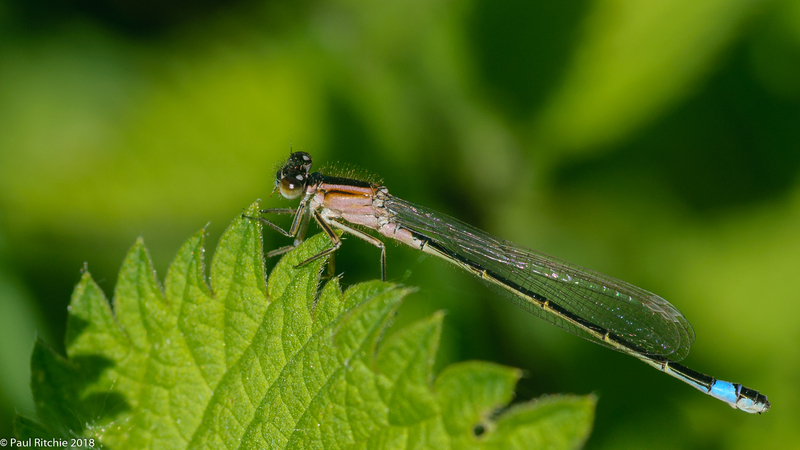 A young female Beautiful landed on the fern, breaking me out of my reverie. 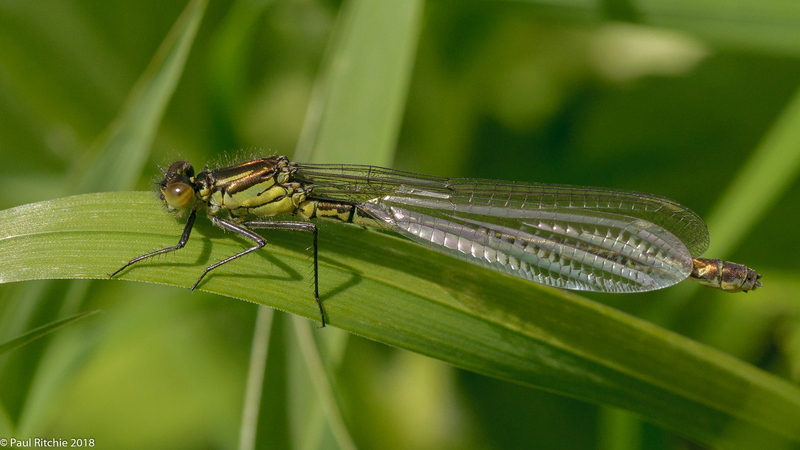 Photo opportunities were few & far between today and I hadn’t had a chance to use the macro, so I reluctantly returned along the stream where at least an Emperor offered me another chance to sit bank-side – only this time with the camera in hand. Let’s be honest – the weather on Wednesday was far from optimal. Unusually the BBC gave a better forecast than YR – light cloud and light winds. The latter was correct, but the clouds were often a darker grey. Nevertheless instead of being stuck in front of the PC I decided to have a look anyway; a chance to wander off the beaten track a little. I started at Town Common, taking a different route than usual to explore the SW section. 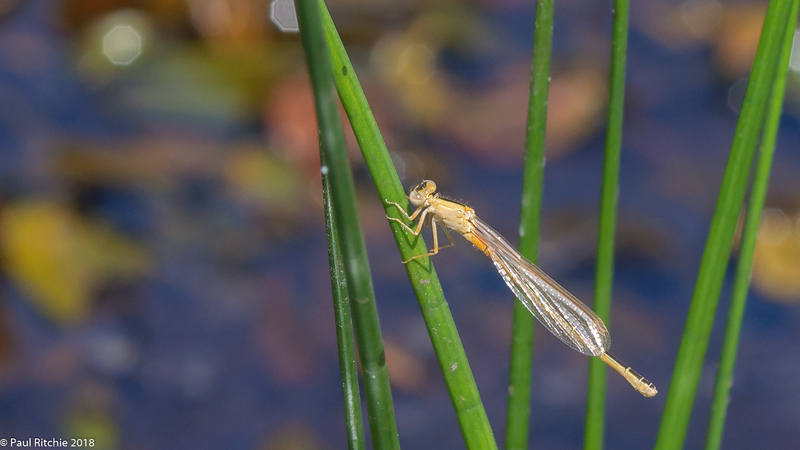 A few more ponds to investigate in the future maybe, if I can drag myself away from the favourites. One of these ponds is a recent addition and will need time to mature but will serve to be a prime breeding pond for Black Darter, Common Emerald and Small Red as the recent ponds across the bypass have proved to be. Approaching the key area I had a sighting of one of the resident Peregrine, a display of Dartford Warbler and a couple of Smooth Snakes. Too cool or dull for the Sand Lizards, or too blind on my part. 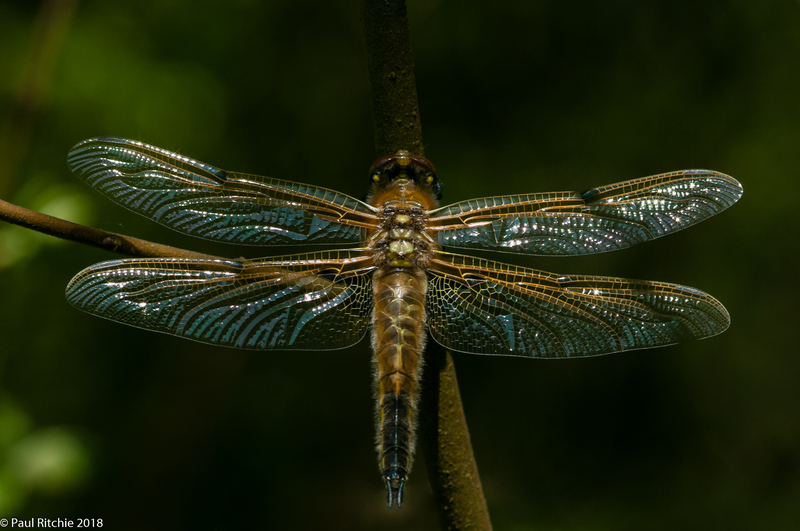 None of the ponds had any activity over water whatsoever – even the hardy Four-spotted Chasers were noticeable by their absence. 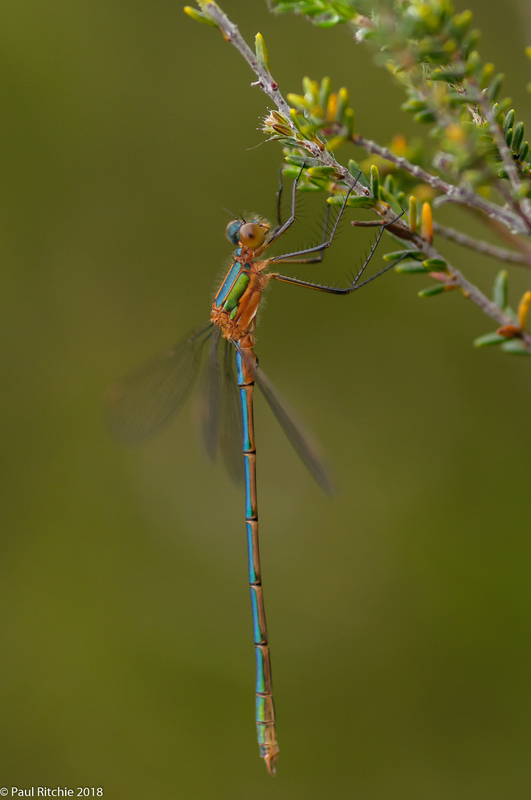 Just a few Azure, Common Emerald and Small Red within the heather. 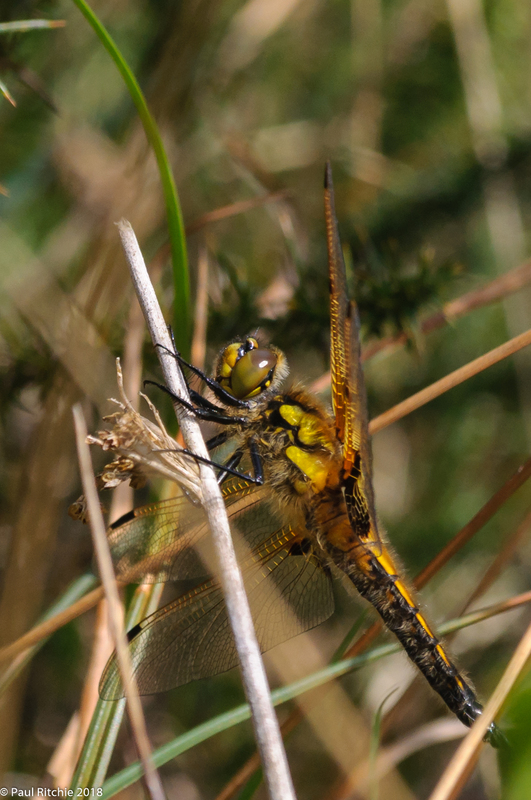 There were the occasional Scarce Chaser laying low in the heath but not the crowd experienced on Monday. Respect to the Scarce; I thought the Four-spotted were hardier! 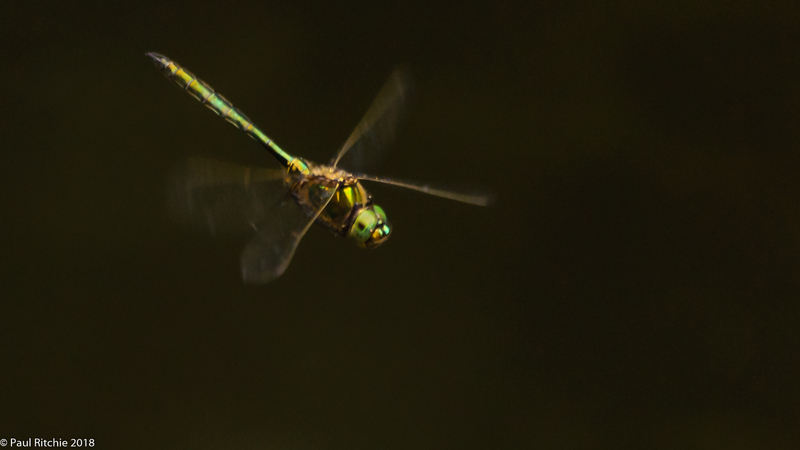 The damsels gave me more than enough to experiment with, the low light offering some interesting challenges, including finding the correct level of flash to reflect the metallic shimmer of the Emeralds. A proper flash (and diffuser) would be better, the above examples a little harsh, however they show the immature gender differences well. On the way out I encountered the historical sight of an old & grizzled chap with a huge leather bucket, a shovel and a huge iron stake. I nodded but didn’t receive an answer; maybe he was up to no good or maybe the space-time matrix experienced a glitch. Over on Ramsdown I encountered a gravid female Adder sunbathing on a corrugated sheet who hadn’t heard or seen me coming and had another Smooth Snake sighting. 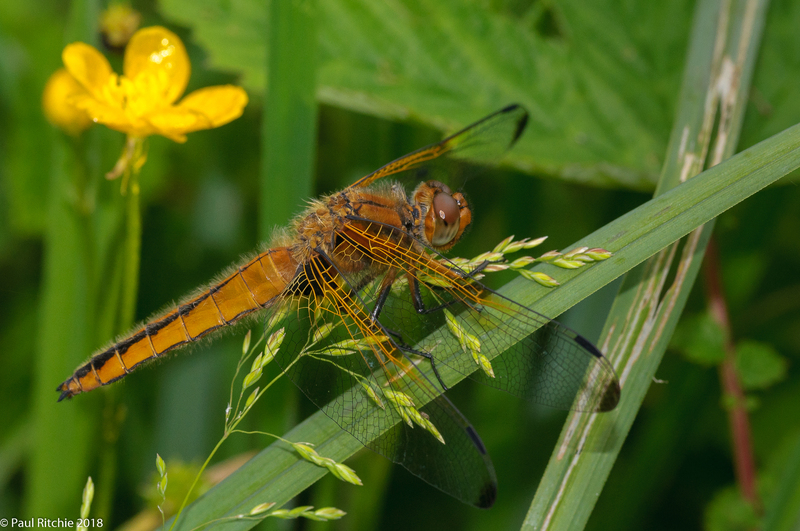 Another Scarce Chaser on the heath, a couple of Emerald and a Four-spotted Chaser (at last) near the hill pond. and plenty of those pesky flies hovering around yours truly, the living embodiment of Pigpen from Peanuts. Continuing on to Troublefield I noticed the DWT crew were present but thankfully not in my meadow. The first surprise was the level of growth in a week; frequently chest-high and sopping wet, but immense fun! 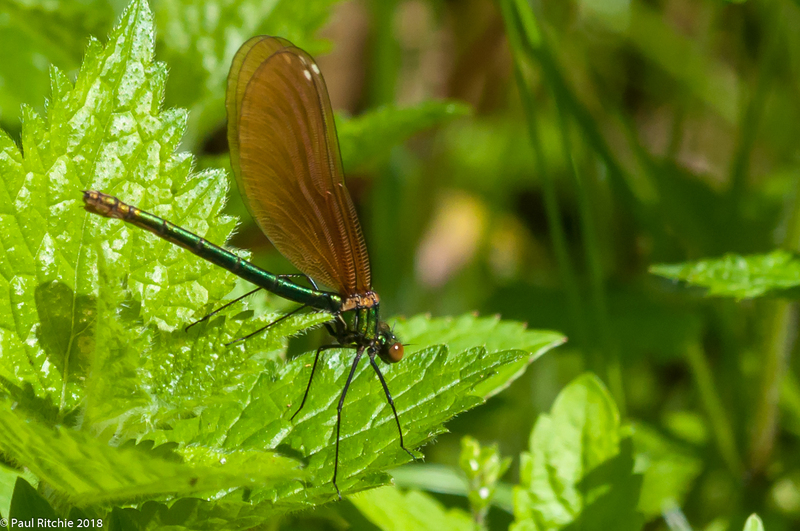 Banded and Beautiful Demoiselles were present in good numbers and were keeping low and yet another Scarce Chaser, the first one I’ve seen here this Spring. More Large Red and Azure but alas no White-legged; the grasses only offering up a swarm of micro-moths and something more sinister which avoided my liberal spraying of insect repellent to festoon my upper arm and shoulder with an array of bites. Challenging and frugal, however a fine wander. We have a rule to ignore the New Forest on Bank Holiday weekends for obvious reasons, like traffic and tourists, Having been robbed of Saturday, which turned out great despite forecasts to the opposite, we decided to have a look at Latchmore. Not in the best of shape after a party evening the night before, the going was tough in the heat and humidity., however I was glad we found a place to park despite inconsiderate parking from day trippers. Amazed at how wet the ground was. Heavy rainfall the night before perhaps? After the sun we’ve had the flushes, which should have dried out by now, offered extra obstacles before the mire. 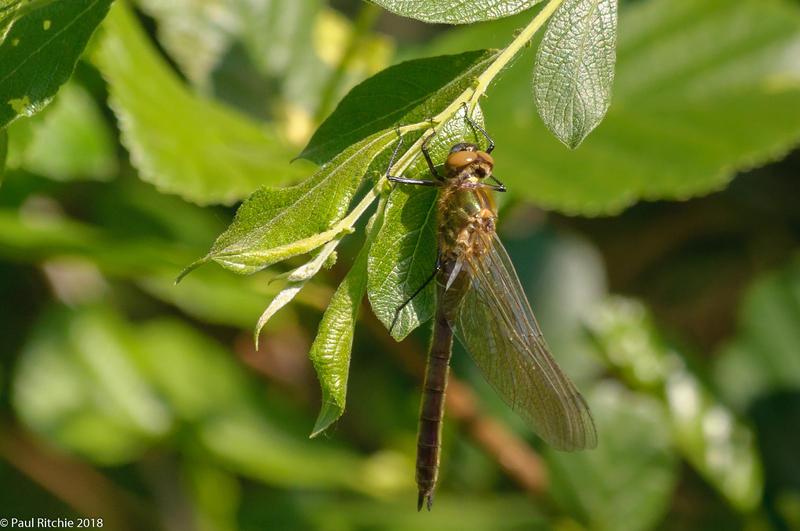 On the walk in we had Large Red, Azure, Beautiful Demoiselle and Broad-bodied Chaser, however as soon as we reached the mire we had our first Scarce Blue-tailed, a female and couple of males were holding territory in a flush. 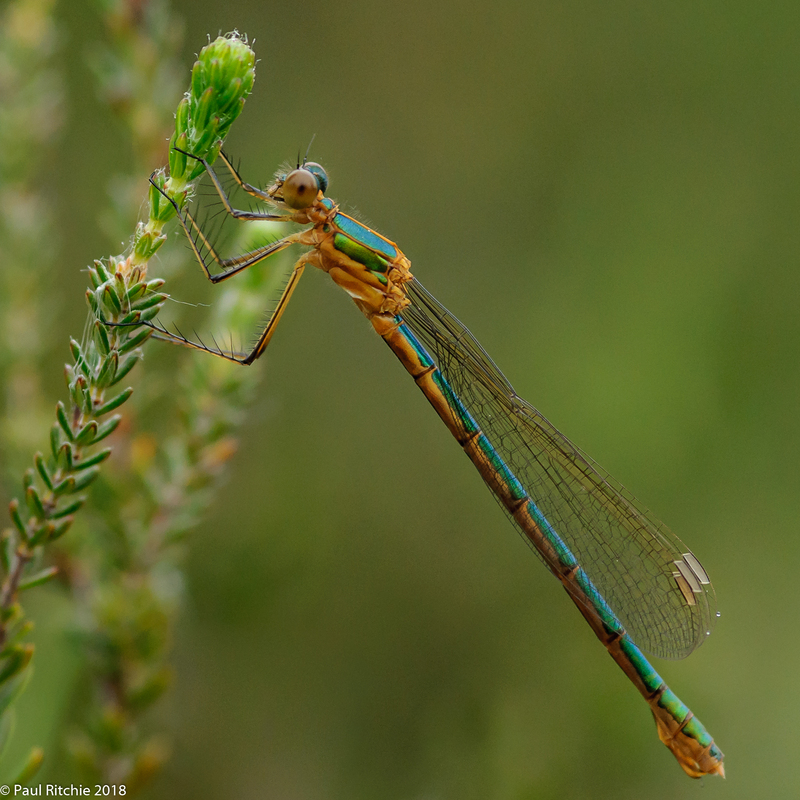 Despite a good two hours scouring the scrub for feeders we only managed a few other damselflies other than Large Red, a teneral female Southern being the first. The second highlight was a flighty teneral Small Red. 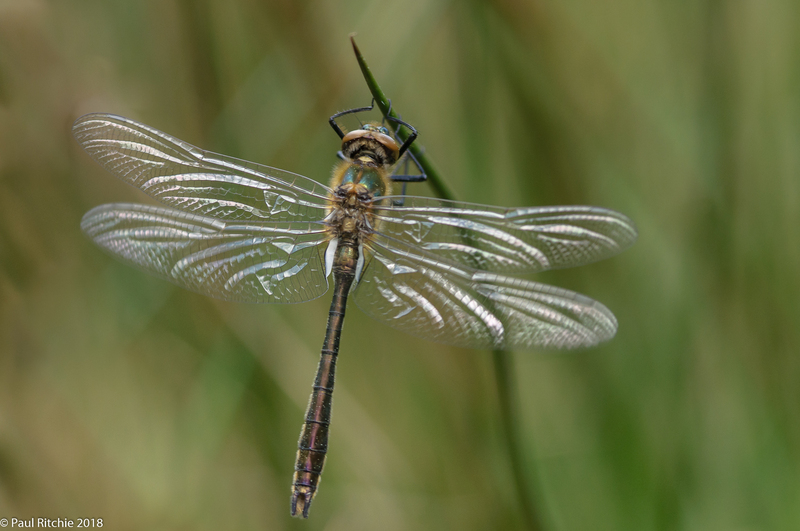 We did disturb a resting male Golden-ringed who flew south at speed before moving on to Gypsy Hollies where we encountered our first Keeled Skimmer. The stream south had the best showing of Southern so far. 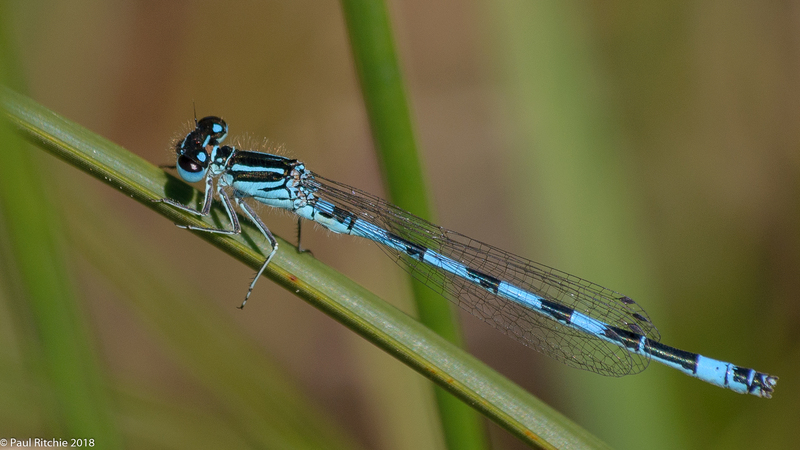 Enjoying a small pool were a couple more male Scarce Blue-tailed. Another glorious day with ‘potential’ light rain showers. Yeah, right – very hot and very humid again at Town Common. 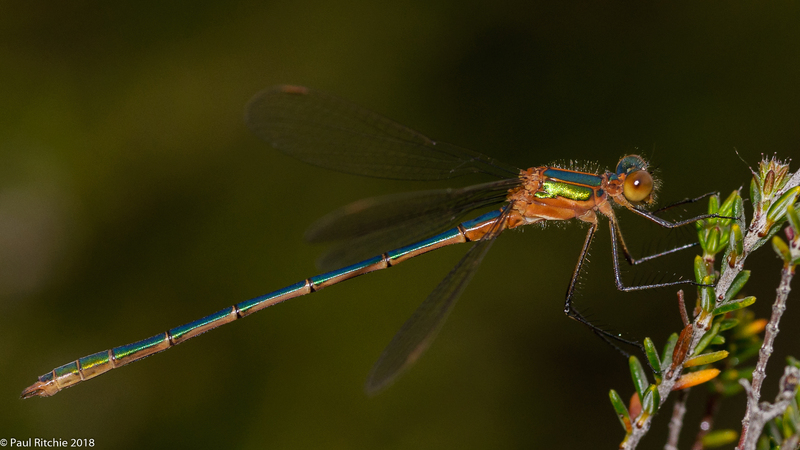 I figured if Small Red and Black Darter are out then Common Emerald might well be too. It wasn’t long before I found the first of four teneral Small Red. 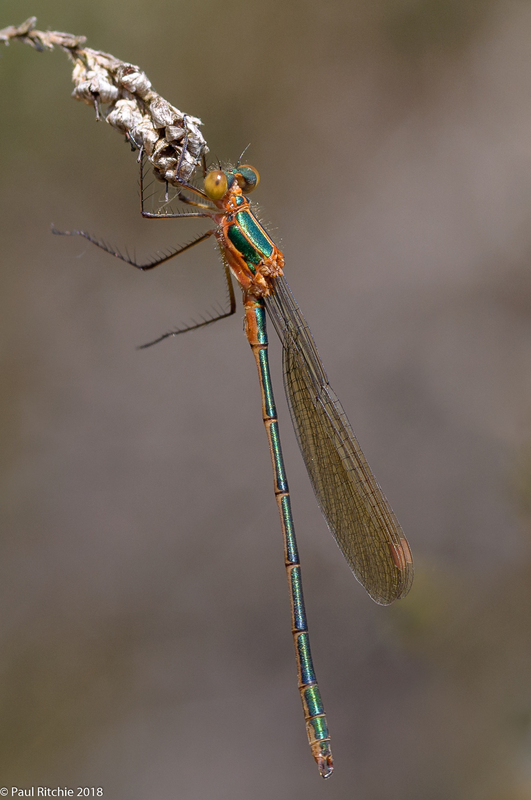 Shortly afterwards I found my first teneral Common Emerald. Over the water a bevy of frenetic Four-spotted were wearing themselves out while a male Hairy patrolled the reeds. 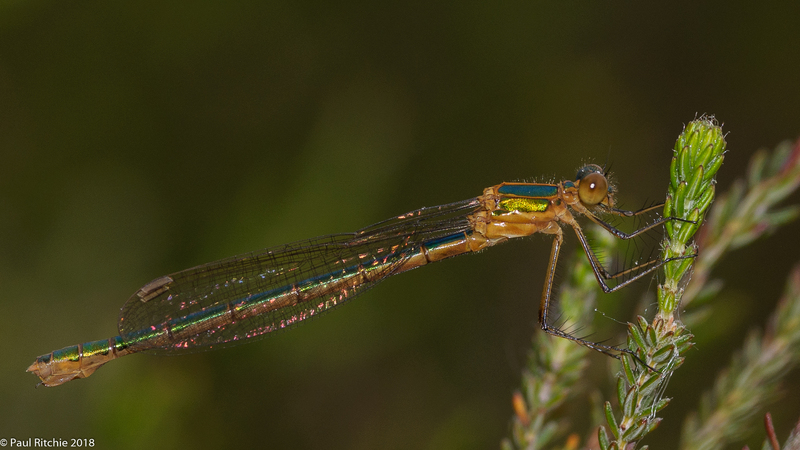 Meanwhile in the heather a few more fresh Common Emerald. 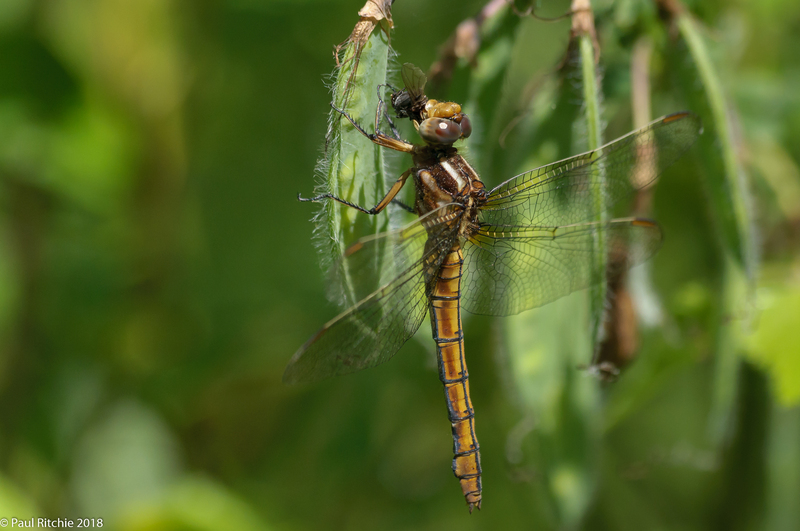 The humidity had soaked the pair of us through to the bone so we took a circuit where we encountered a swarm of Scarce Chaser. Quite why they chose this particular pocket of heath I have no idea, but to see so many sharing the same space away from their natural breeding ground of the river was a delight. After I final foray for the elusive Black Darter we decided to call it a day as we were both uncomfortable from the heat. 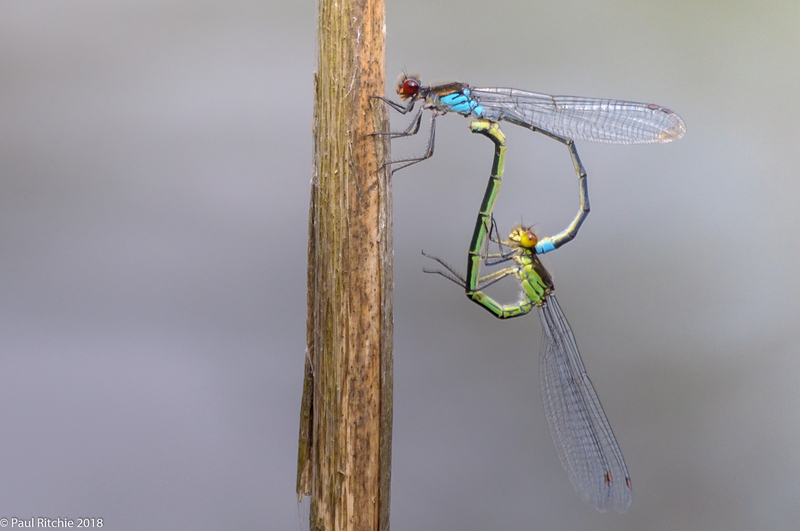 Still, six species to add to the season’s list on a weekend we weren’t going to bother with? Phenomenal frankly. Rule suitably broken. 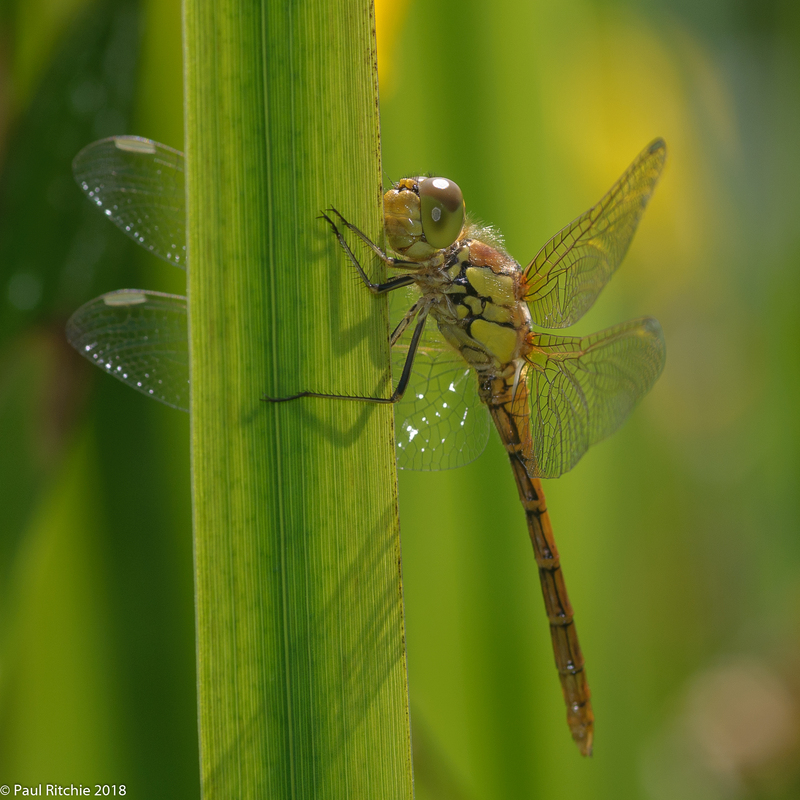 There’s no doubt May has been a marvelous month – certainly the most consistent sunshine we’ve had for a long while, which means there’s been little time to keep the blog updated as frequently. 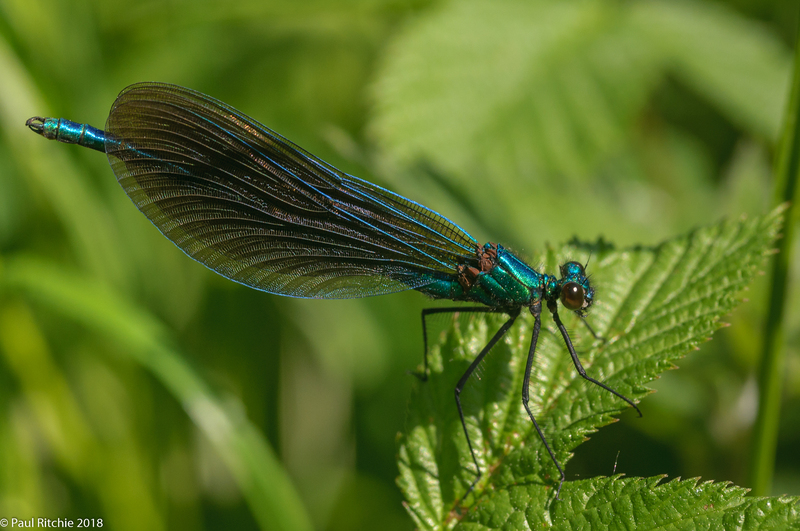 Troublefield had certainly woken up since my last visit with a bevvy of Demoiselles. 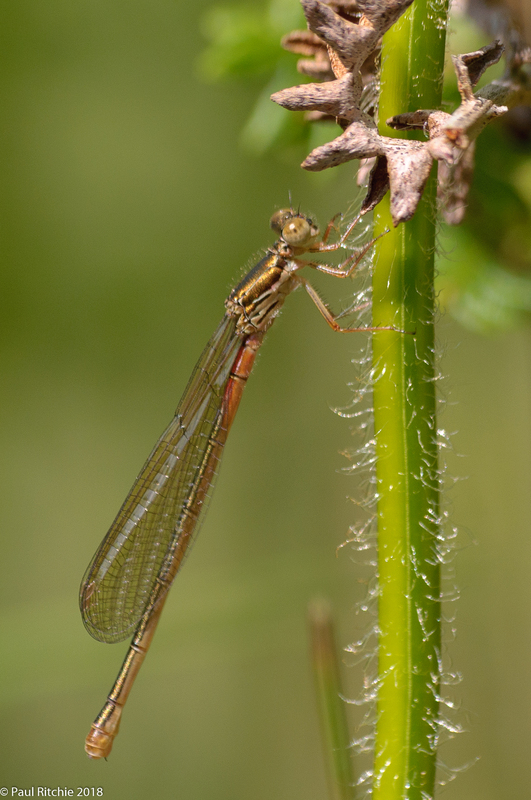 I was hoping for a Scarce Chaser or two but the presence of a female Broad-bodied added some variety along with Plenty of Azure and Large Red. 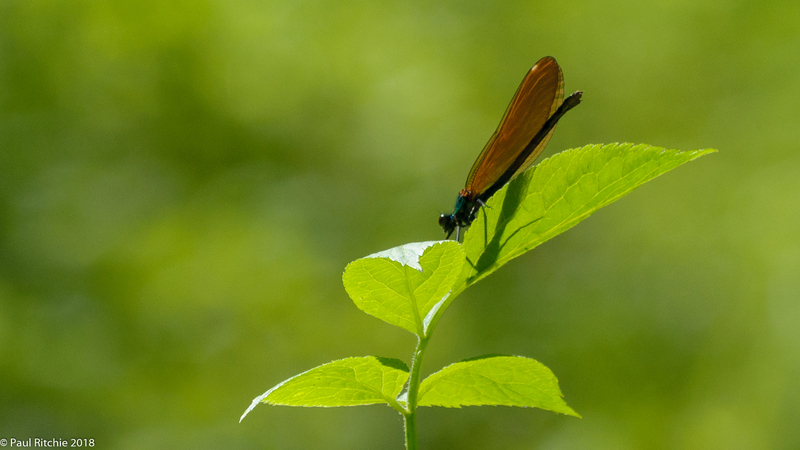 Most of the Demoiselles were found in the middle meadow, which was mainly down to wind direction. 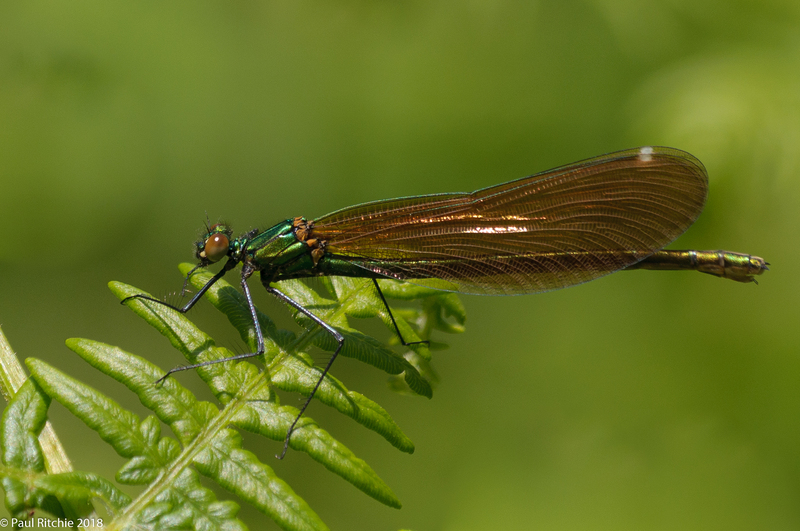 The north-west corner proved to be the choice spot today with enough Demoiselle action to pick & choose. Once I’d had my fill I headed over to Ramsdown where I did see a Scarce and, more interestingly, my first Emperor of the season. 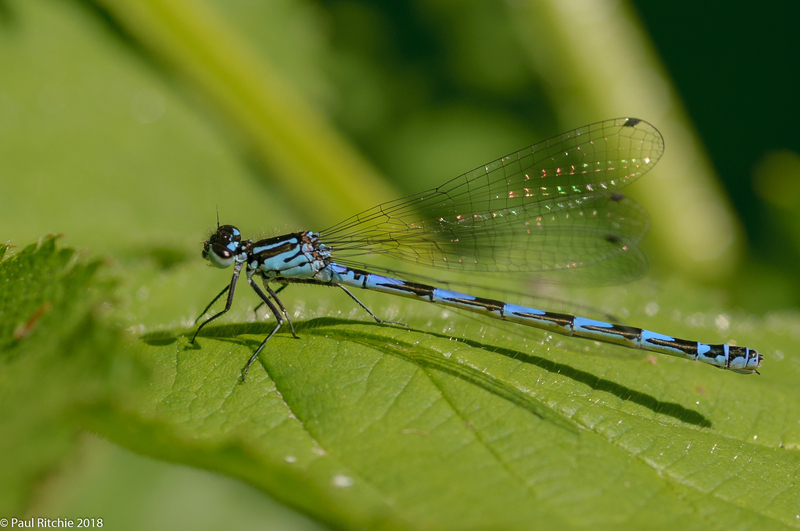 Four-spotted were busy on the pond along with Large Red and Azure, frequently in tandem. As I was in the area I thought I’d try my luck at Canford Magna. 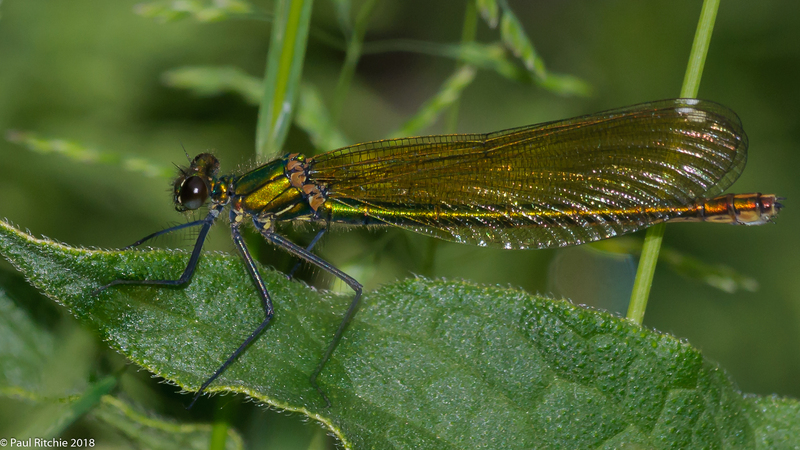 Alas no White-legged but a few Banded Demoiselles and the marvelous sight of dancing Mayfly. Although being one of my go-to sites, Bramshill still has the ability to frustrate. Saturday proved to be one of these days with little opportunity, albeit satisfying to observe. Downy were present in good numbers during the walk. 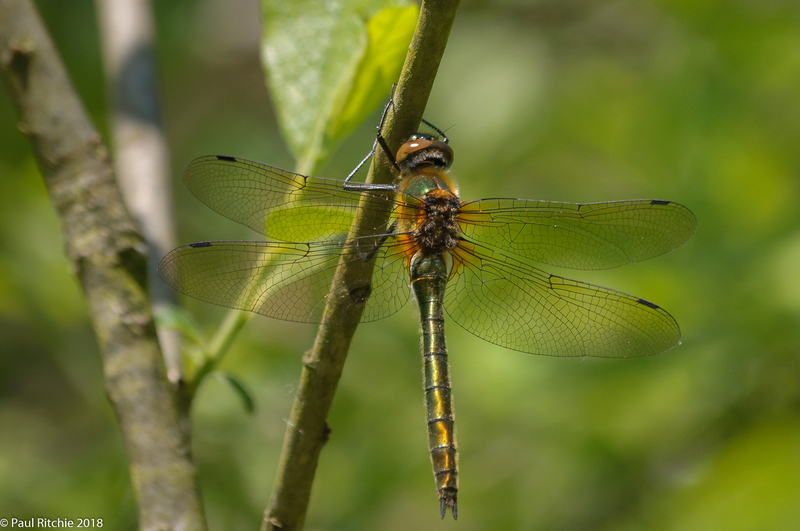 Along the main track a muddy puddle played host to a male Broad-bodied Chaser while the green pond had a patrolling Downy and male Hairy which I attempted to get busy with and a fresh Emperor rising to the trees. Over in the sunny corner of Long Lake a teneral female Downy gave me my first real opportunity of the day. Back at the muddy puddle the male Broad-bodied gave me my last. I returned for another go on Monday with varying success. 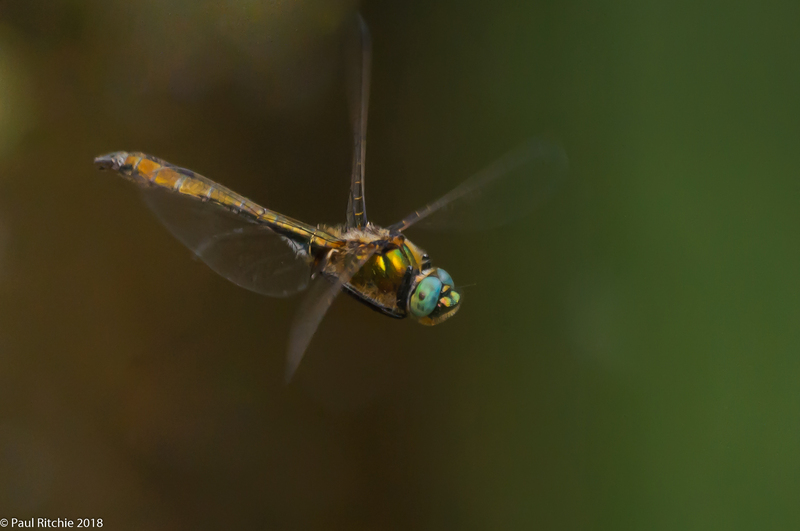 A little more action on the water and my first Black-tailed Skimmer of the day disappearing out of reach. 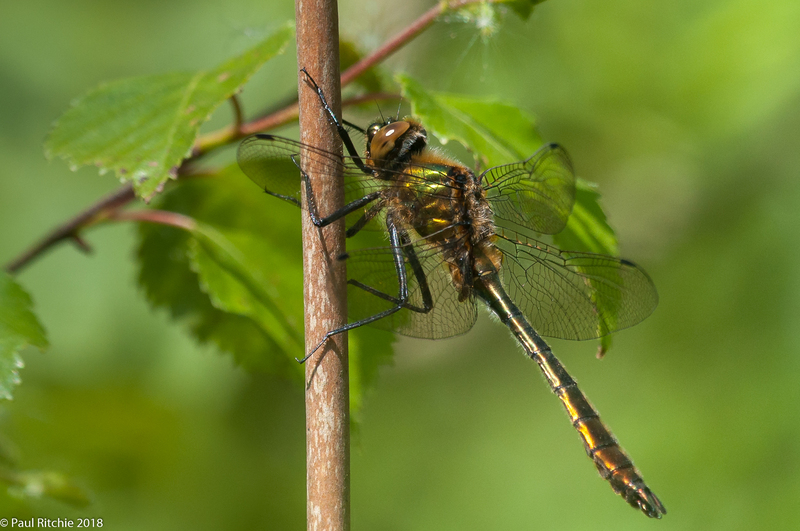 A few more Emperor sightings with a fresh female disturbed at the green pond and a couple of males feeding along the tracks. Four-spotted were once again the dominant species. There were a few Downy patrolling out of reach at Long Lake while in the corner a mating pair of Red-eyed balanced on the bulrush. Then the clouds appeared along with a slight shower and that was the end of the sun except for a hazy glimmer two hours later where I found a Downy patrolling in the gloom of an inlet. Also sharing the same space briefly was a male Hairy which, although not perfect, provided the most memorable shot of the day. Now the Emperor are out that may be my last chance to achieve better this season. That’ll do for now. I make no apologies in the delay of updates; it’s been a fine May, and I’m going to make the most of it. After all, with our climate it’s a possibility that we might have had summer. That’s humour by the way, not negativity. You could positively look upon a cold winter as a precursor to a fine summer! I had a grand time at the Somerset Levels, and there’s more to come, however for a change of scenery I decided to revisit Lower Moor Farm in Aston Keynes after several years. The Wiltshire CDR, Steve Covey, and a few other good friends from Flickr and Facebook steered my choice with their fabulous photos of Downy seemingly willing to perch long enough for a photo. Weather was perfect, however navigation was not. I’ve been using Waze for a few years without error yet for some reason the postcode entered steered me directly to Melksham, which was a tad off the mark! I should have known from memory, and despite a nagging feeling I carried on, seeing some marvelous aspects of the Cotswold countryside I’ve not seen before. I finally arrived an hour late and eager so I made my way around the reserve until I located the hot-spot – a path with a perfect row of trees face-on to the sun. I’d already encountered several Downy on the walk through so signs were good. 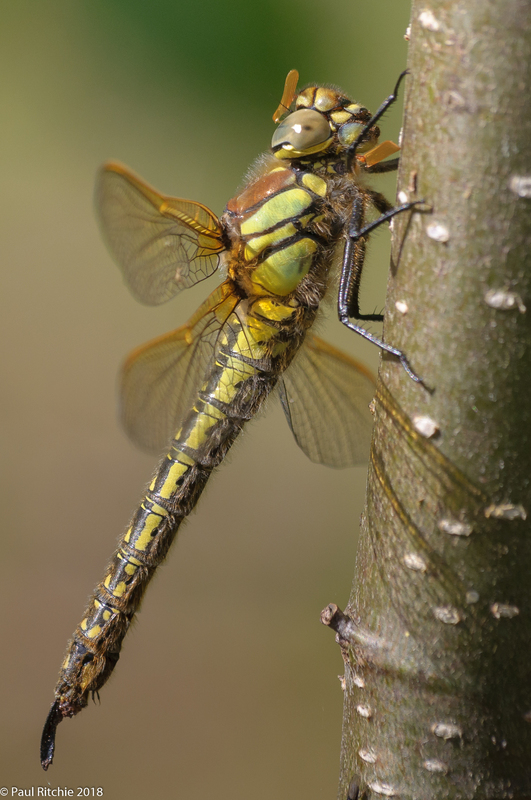 There were a few people already on site and one helpful individual with bins pointed out a fresh male with wings still closed high in a tree while within the confines of some lower branches was the perfect opportunity. It wasn’t long before I was on my own so I took in the surroundings and waited for my own opportunities which on one occasion featured a photo-bombing Azure. Nice one that; let’s get in a tad closer if he’ll let me. I explored the path to the south which also turned out to be a prime feeding spot with several circling the trees and usually landing high. So much to explore here, but I needed to focus and returned to the path and waited. Besides the Downy their were also a few Hairy coming in to feed, flying low along the path, and a few Azure. However I was here for the Downy and remained focused. The feeding activity became more sporadic during the heat of the afternoon and the next major feast would more than likely arrive early evening and having stood in more or less the same spot for hours I had one last look around before the long journey home. So the hype is real then; a marvelous little reserve to spend a few hours – especially for Downy. A Flickr friend of mine posted possibly the best Hairy photograph I’ve yet seen the previous day, so I knew it was time. I’d already planned a visit for this week and, as long as the weather held out, I’m going. If you’ve never been to the Somerset Levels, you’re missing out! 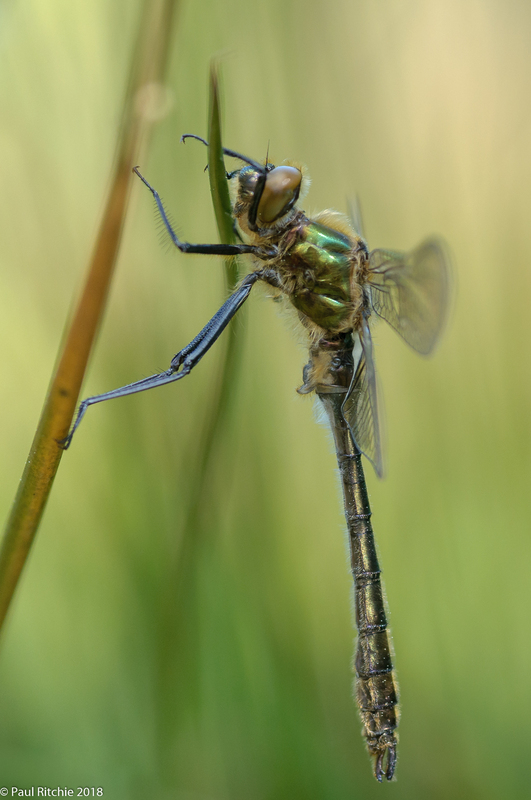 My favourite days are days filled with too many dragonflies to cope with, and today – as most days at Shapwick – was one of those days. Weather was better than expected. Sure, a stiff breeze keeping you on your toes, but the diversity. First in the gate were Variable, Blue-tailed, Large Red, Azure and my first Hairy; a female flushed from the grass to land on the bramble. Another one shortly after, and enough opportunities in the river bank to keep you sane despite the grass strimmers ruining the natural soundtrack as the work party were shaving the margins, along with a few unfortunate victims. With the incessant buzz still in my ears I attempted to seek a quieter environment. I’ve always been a fan of the ‘Sweet Track’; something very mindful about following in the footsteps of our ancestors, however managed it may be to recreate the experience. It’s magical – as you walk through the west-country equivalent of rain forest you are among nature at it’s finest. A brook-lined path festooned with all manner of insects to a soundtrack of birds and buzzing. 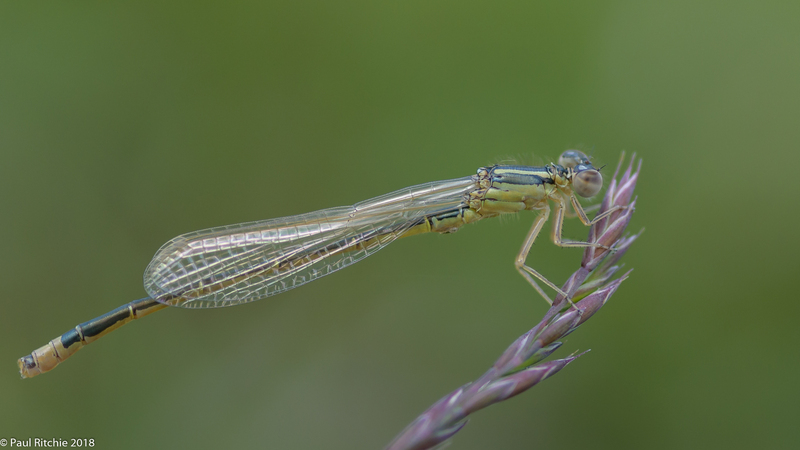 Every sunny clearing, no matter how small, revealed a Hairy or five, a few nervous Four-spotted and enough damsels to grab you macro and indulge. I wanted to walk around again, and did. I hadn’t grabbed a photo for what seemed like ages, but I didn’t really care; such was the peace and ‘nature’ of this place. Back on the river bank I noticed a fresh Scare Chaser in the grasses. Three in total, although a few of those Four-spotted I spotted earlier at a distance might have been candidates. Chuffed and hungry, I grabbed a snack and drink and had another go, but it was quieting down here so maybe have a look at Westhay? Glad I went. 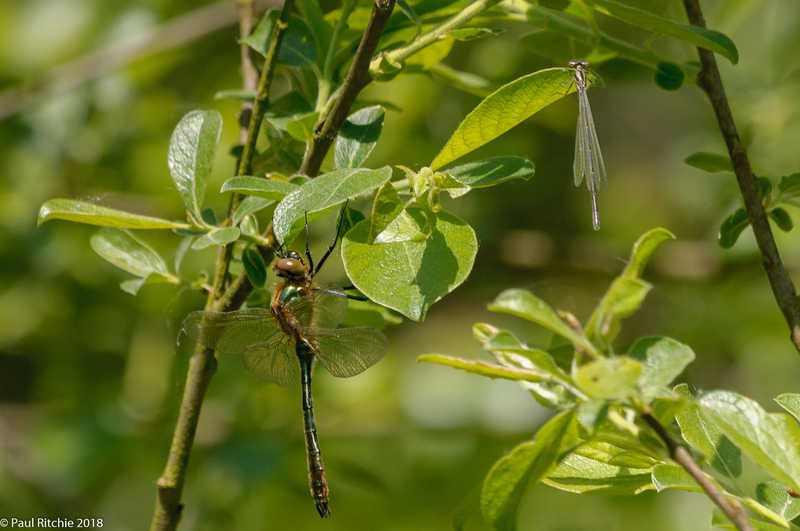 Excellent Hairy activity with a good swarm of both sexes feeding along the treeline on damsels and any other unfortunate insect stupid enough to get in their path. 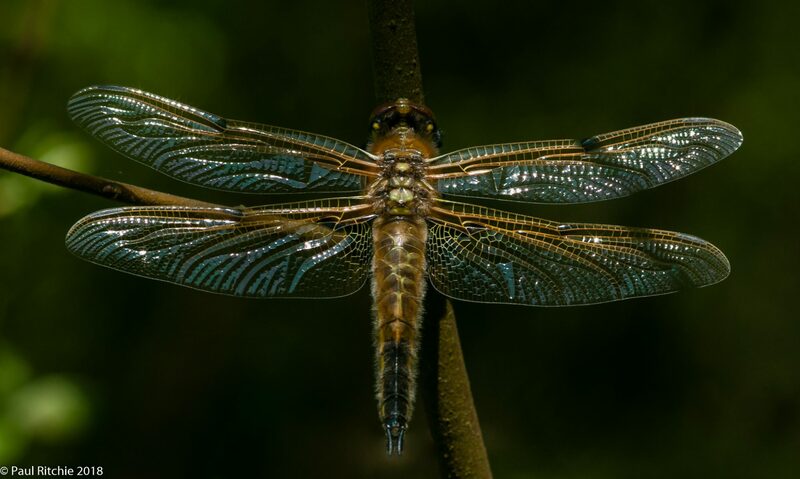 The insect equivalent of a shark attack|? You have to wonder. I’ve witnessed the community behaviour of Brown Hawkers enough and believe there is some team activity present. Think about it – in these moments with Hairy (and Migrant) have you seen aggression within species when feeding? I haven’t – only when procreating. So a thoroughly enjoyable day, and one I look forward to every Spring. There is no doubt it’s been a cracking month with barely a week offering up more variety than you can wish for. On Wednesday I had planned to go to Troublefield, but the weather looked better last minute at Bramshill. Besides – I needed to photograph a Downy. The new parking measures in place mean a longer walk in to my favourite spots, so it was time to find a few more. Heading east I searched out the direct path to the wooded pond – which has thankfully been cleared of scrub along the north bank. 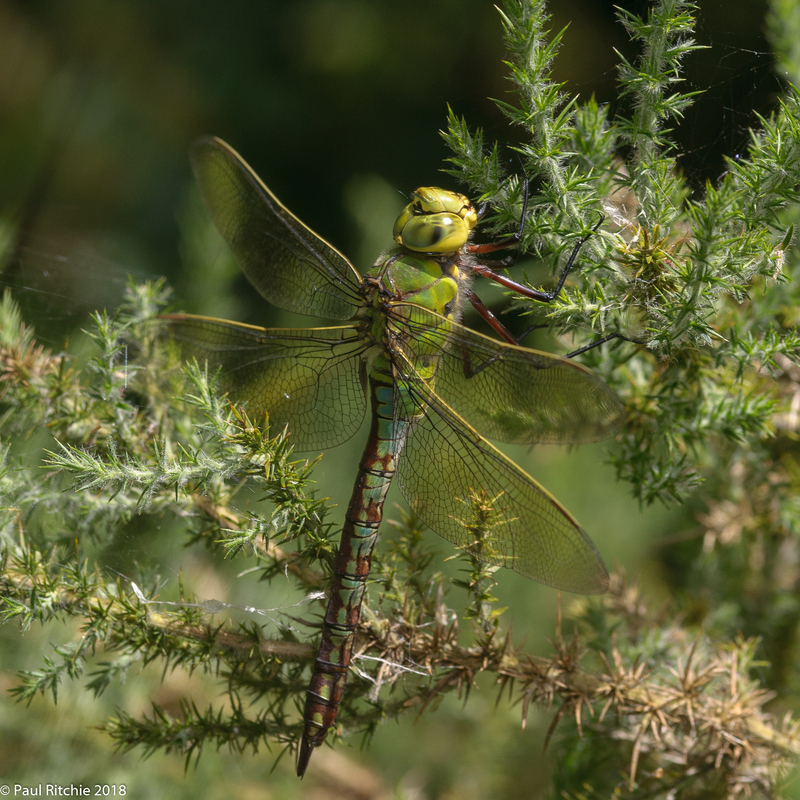 It wasn’t long before I found my prize – three of them feeding within a small sunny clearing. One of them landed perfectly upon a low branch and I wasn’t ready. By the time I’d checked the settings he flew off. No return or sign of the other two despite waiting 15 minutes so I carried on to the pond in search of more. Another two up & away before I decided to carry on to recce the other pond – one I’ve preciously failed to locate until last week. Already up to my neck in gorse and mud I found another three along a wooded ride and another on my way back through. Waited again, and after a while decided if it was meant to happen it’ll happen when it needs to. 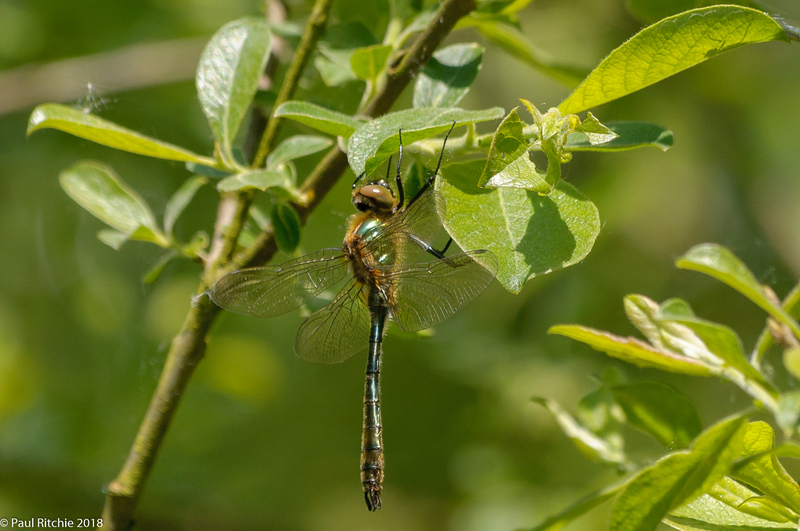 On to the usual spots and everything appeared as it should – Four-spotted more numerous than the weekend and a smattering of Common Blue, Large Red and Red-eyed, but still a little subdued. 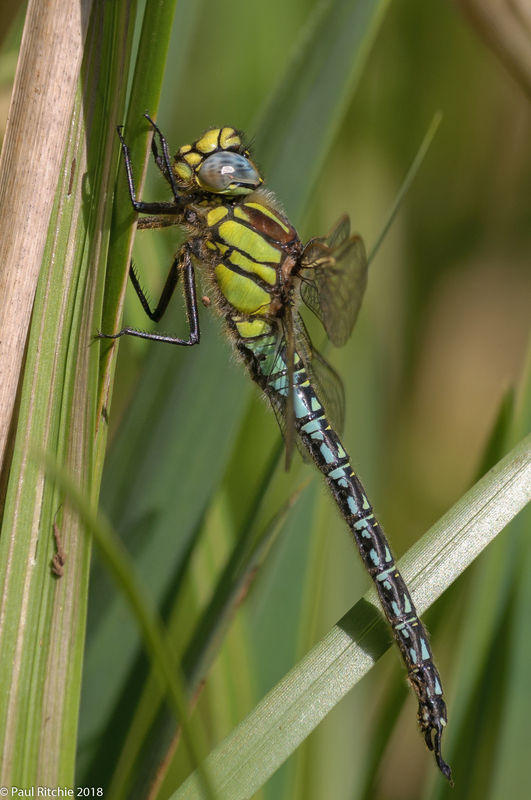 At my favourite pond the sight of rising teneral Four-spotted and even one male patrolling the pond announced Summer and over in the far corner I spotted what I thought was another perched on the reeds, until I took a closer look. 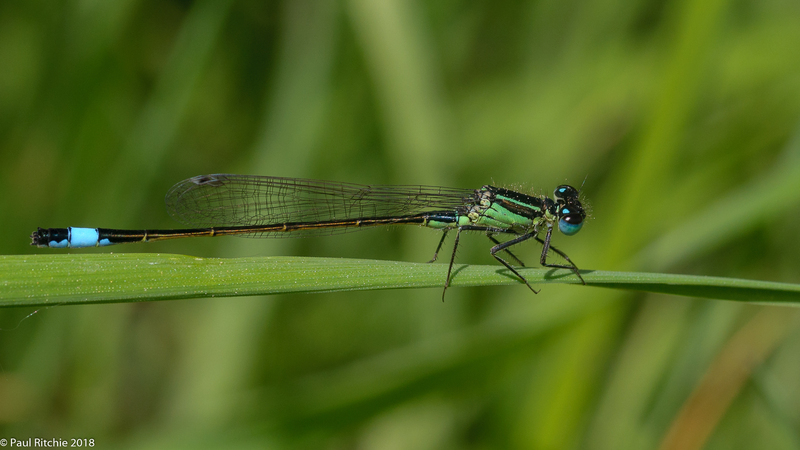 Not one, but two Downy – one still emerging and way out of reach and one just released from the exuvia, crawling up the sedge, wings still folded and getting ready to enter our world. I couldn’t have wished for a better encounter. I wanted a Downy and, although I had to wait, I was rewarded with a better than expected opportunity. 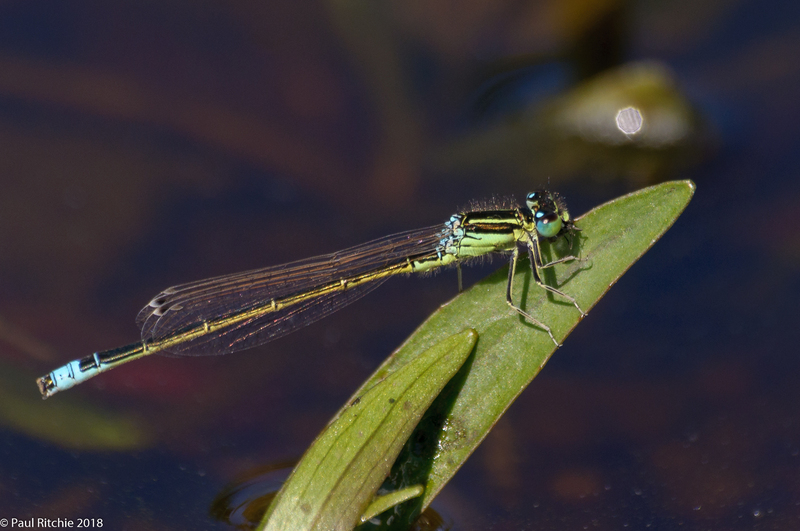 Only downer (sic) was the location; low down in the sedge in the shadows with sun-spots seeking through when the sun shined and the only possible composition meant kneeling in water, which sort-of negates the wellie protection! Afterwards the cloud rolled in making it even more of a challenge, but this was my moment to cherish as I watched him open his wings, vibrate and warm up and finally take his maiden flight. This is what it’s all about. Perfect! I had a plan to walk back up to the wooded pond but frankly I had my moment, my opportunity, my prize. 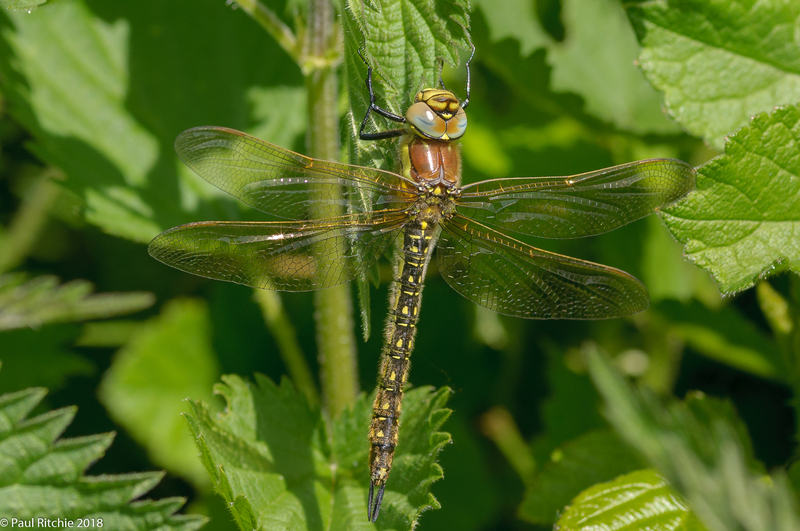 A promising forecast and a week of waiting took me back to Bramshill to find less Large Red than last time but I did have a few larger species sightings; a Downy, a Hairy and at least three Four-spotted Chasers. So frustrating not to get a better shot, but a record I could guarantee despite being annoyingly elusive. After that the sun went in and didn’t come out again, so I took a walk and scouted a few new locations to explore further in a month or so. Sue & I prefer to seek out the quieter places on Bank Holiday Weekends, away from the screaming hordes and traffic jams. We opted for Bentley Wood. Plenty of Large Red and a teneral Downy rising from the margins to drift high into the treeline. Our favourite pond turned out to be very disappointing though. 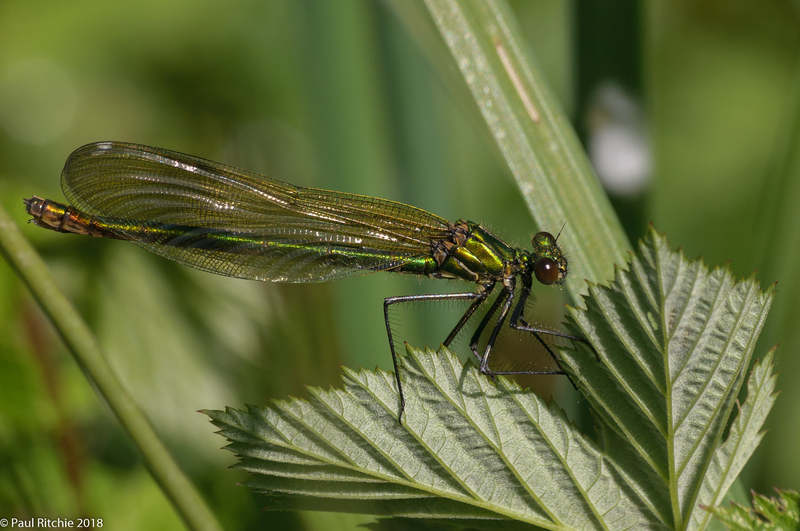 We decided to have a bash at Durley Mill as Paul Winter had found some Beautiful Demoiselle elsewhere the day before, so fingers crossed. They’re here. 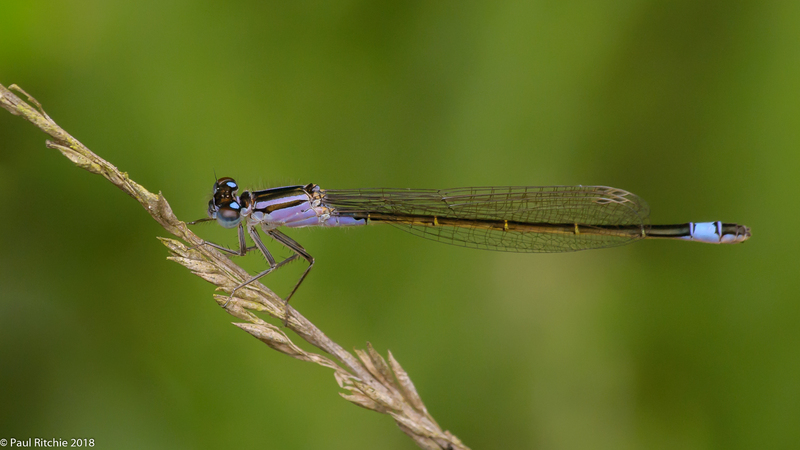 Not many, just a half-dozen and another species to add to the count. Bramshill proved much more productive with a fantastic eight species on the wing! 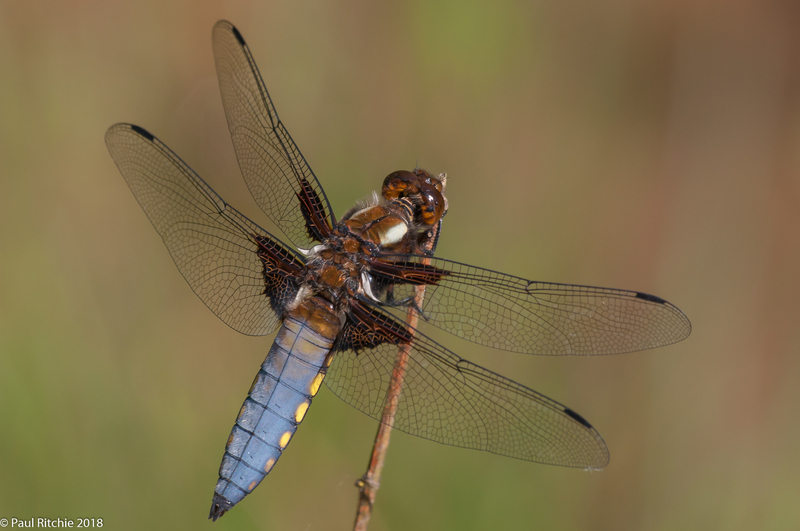 A Downy on the way in followed by a male Broad-bodied Chaser, both too nervous to stick around. 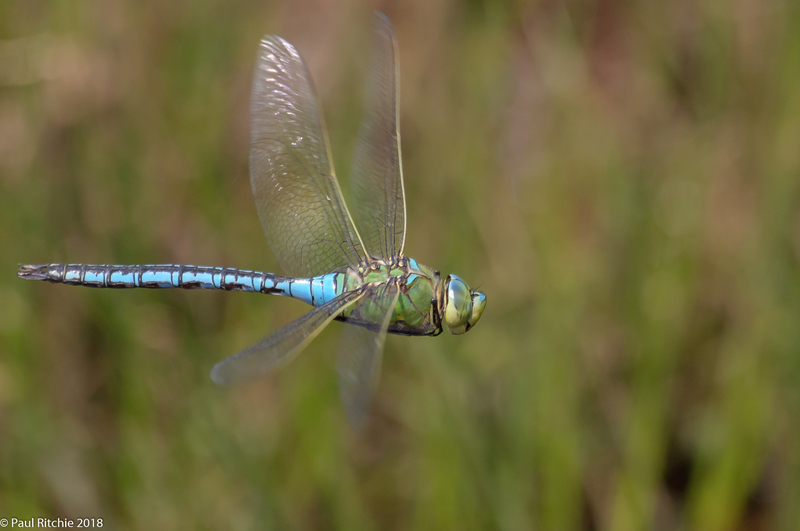 A Hairy Hawker shot across the path at speed and after the usual collection of Large Red we finally found a Common Blue. 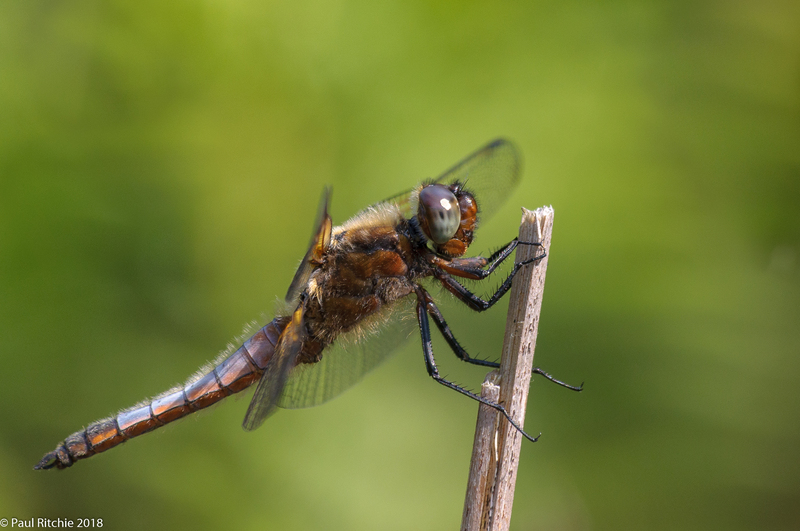 At the pond a very fresh and delightfully-fragile Four-spotted Chaser rose from the reeds to land just above head height in the shadows. 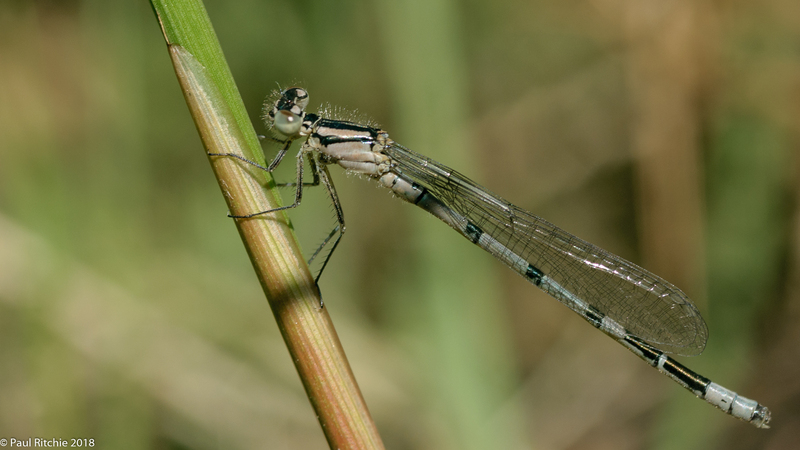 After the ponds Sue took some time out while I dug into the scrub and found an immature male Red-eyed damselfly. Perching low down involved some contortion as trailing gorse prevented me lying down. Worth it in the end though. 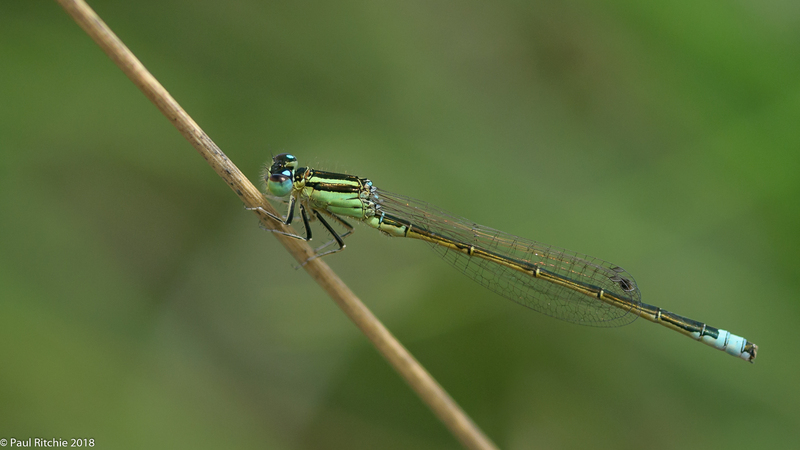 We took a slow stroll back along hawker alley and explored the rough ground bordering the ‘face pond’ where we found another Common Blue and our last new species for the day, a Blue-tailed, which flew out of reach. No matter, there will be hundreds of them to enjoy soon. A thoroughly enjoyable and productive outing renewed my faith and we returned home justifiably satisfied. It would be a hard act to follow. We needed to recharge but found time for brief trip to Swanwick Lakes where we managed to reach double figures with an Azure. Unfortunately the only shot I managed didn’t come up to standard and we failed to find any more. 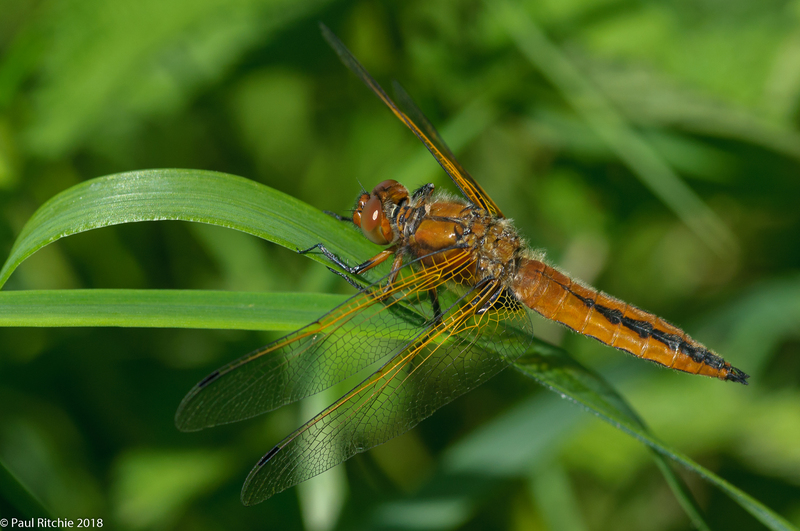 A walk to the dog pond provided one Broad-bodied Chaser and there was a Red-eyed on Tom’s Pond. 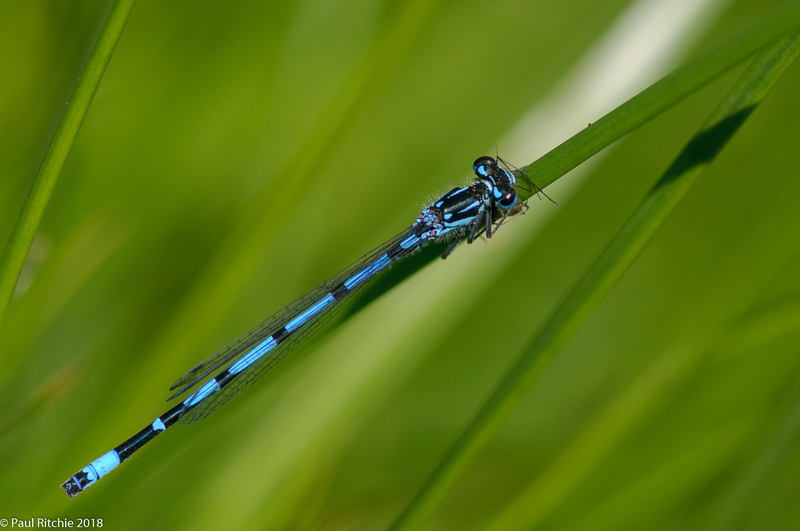 Back at the centre pond I managed a shot of a Blue-tailed. So a busy and fabulous weekend with some welcome diversity. Now that’s more like it ! Our recent warm spell was a temporary glitch, as if nature needed to regain the balance after Spring snow. This past week brought us back down to earth with normal temperatures and lashings of April showers. Large Red are pretty much where they are expected and the new brood of butterflies are awakening. After the first flutter last Wednesday I knew I’d be in for a wait, so didn’t rush it. I took a (long) walk around Bentley Wood on Thursday 19th, eager to check on the favourites and new pond, which will need another year or two to come to fruition. 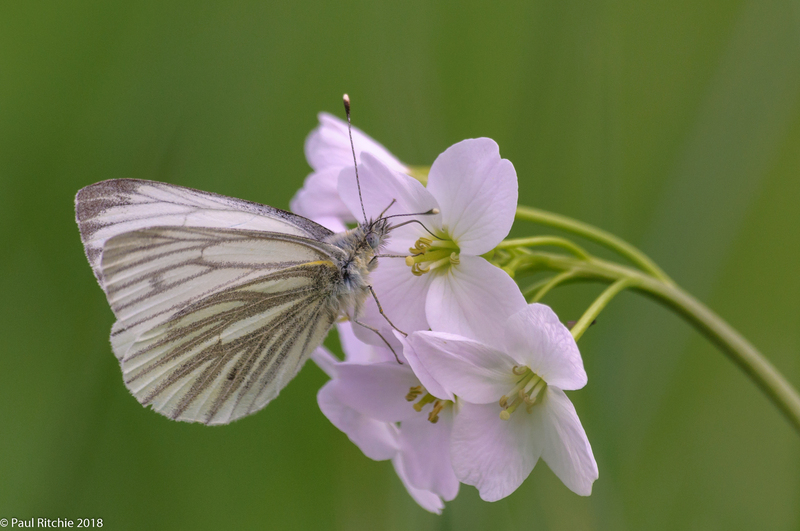 No damsels, but a fair few over-wintering butterflies waking from their slumber. On Saturday 21st Sue & I drove to Bramshill to check on some negative news regarding new parking restrictions. Suffice to say the main parking area along Wellhouse Lane has now been blocked by wooden stakes, with warnings along the adjoining passing places. I don’t know the reason, but have a couple of theories which are best kept quiet until I know more. It’s not as bad as I expected, just inconvenient. It does mean the key areas now involve a walk in, which promotes exercise and a greater feeling of ‘it better be worth it!’ Was it worth it on Saturday? Yes! We had Large Red, and an altogether quieter experience. Red Kites, plenty of other bird activity and more Common Lizards on the ground than I can remember. The resident male Swan seemed especially appreciative to see us! On Sunday 22nd we took first look at Hamble Valley, a denizen of bountiful seasonal Bluebells, Wild Garlic and Spring Butterflies. 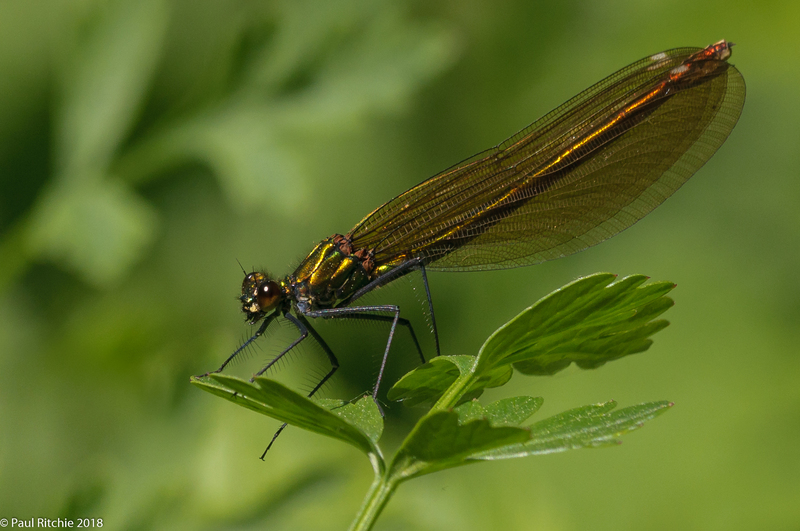 OK, we hoped for fresh Beautiful Demoiselle, but too soon really. 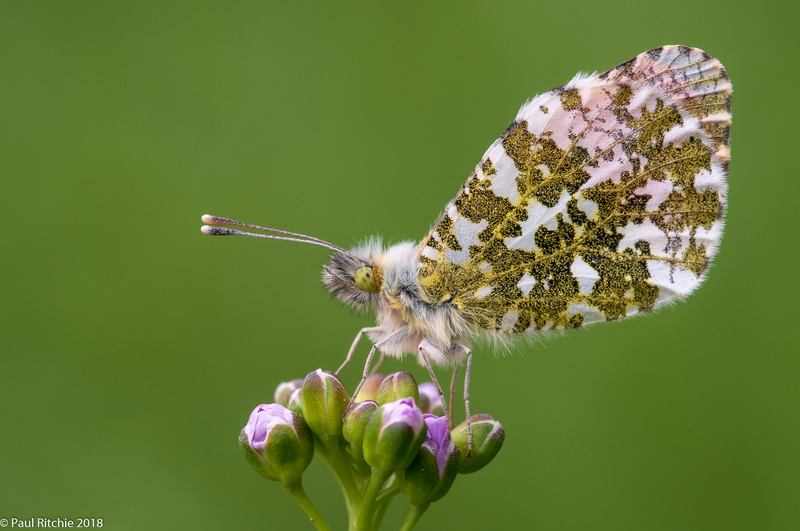 Won’t be long though – the Speckled Wood, Green -veined White and Orange-tip are on the wing and offered some splendid opportunities to get the camera out of the bag. Our darling weather kept me grounded until Thursday when I returned to Bramshill hoping for a little variety. Just Large Red, but in far greater numbers. Especially nice to see the first Green Hairstreak of the season and a chance to explore the hidden depths, which proved a lot harder than expected. The ‘overgrowth’ has blocked all remnants of the paths through the clearing (sic) to the north of Long Pond, however I’m sure they’ll get around to it as they’ve cleared all the gorse stands from the crossroads. Two showers on my visit forced me to stow away the camera until needed, and the air was heavy with precipitation; not the forecast expected. Three hours was enough this time. I’ll give it another week, which, looking at the weather forecast might well be the only option.